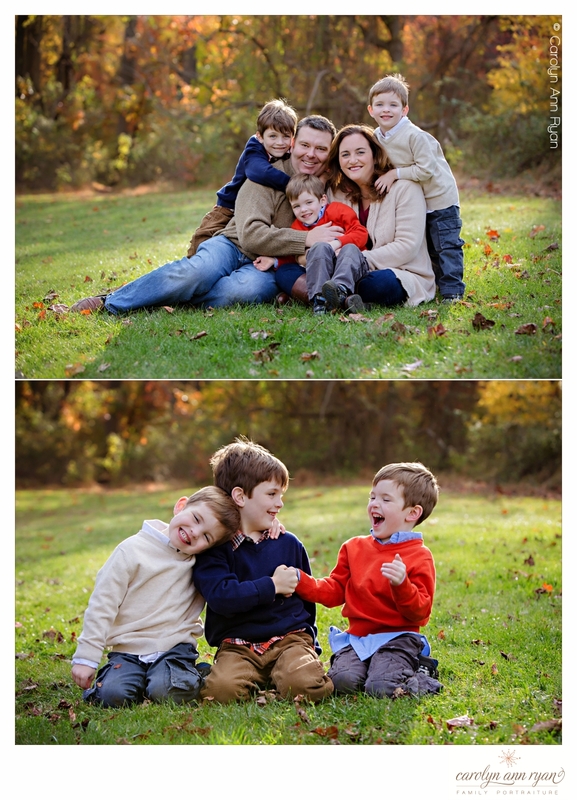 It has been way too long since I shared a family portrait session from one of my clients here on the blog, so let’s start 2019 off with a dose of sweet Charlotte family photography. 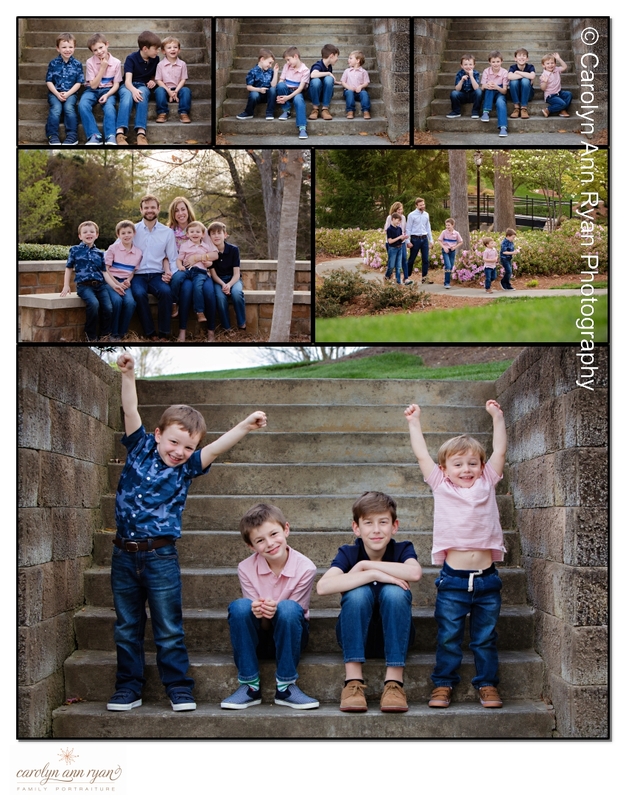 I just adored this Spring session from last year and these four adorable little men with their parents. I love how mom coordinated the pink and navy blue outfits for everyone, but the personalities of each of these little guys definitely stole the show. 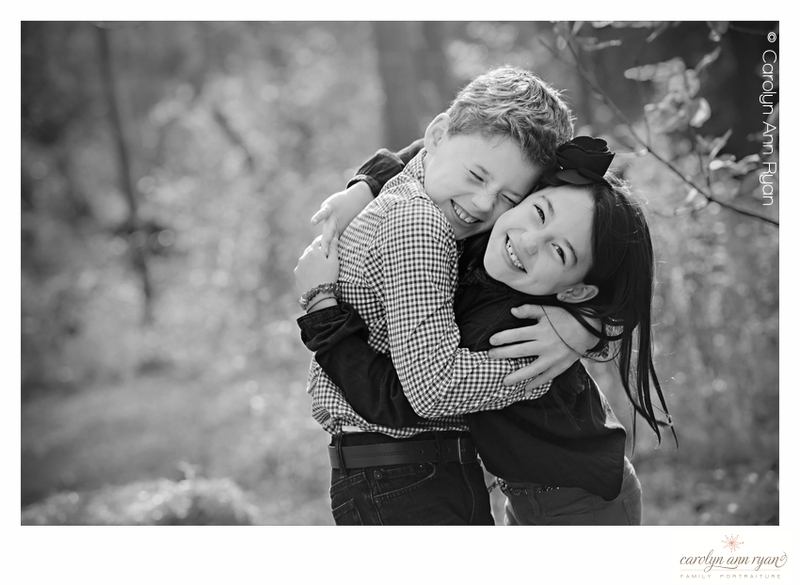 They were each sweet in their own way, but seeing them interact together was adorably entertaining throughout the session. One of my favorite parts of these session were the series of photographs from the concrete stairs. Within each photograph, I can see so much about the boys personalities and relationships to each other. It was difficult to narrow to section of images to just one or two favorites and I was thrilled Mom loved them all as much as I did. As cold as it has been in the South over the last week, Spring is not far behind. Spring is Coming. 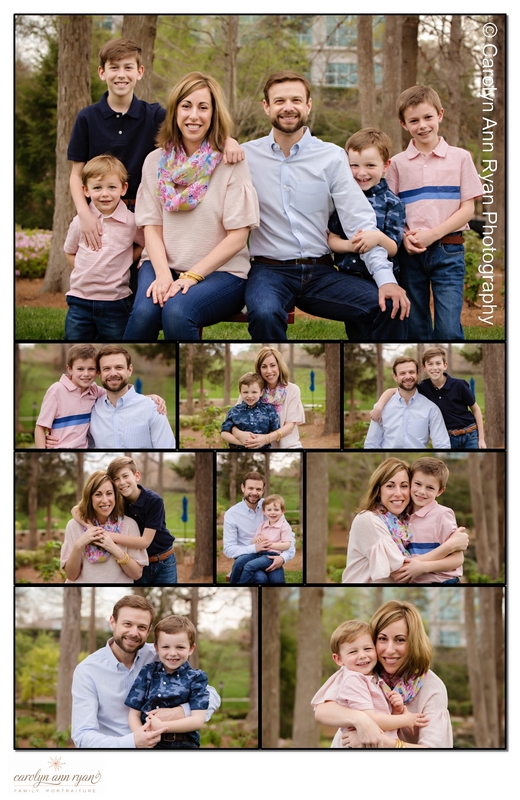 If you are interested in booking your own sweet Charlotte family photography session, then please give us a call at 704-256-7270 or email carolyn@carolynannryan.com. We would love to hear from you! 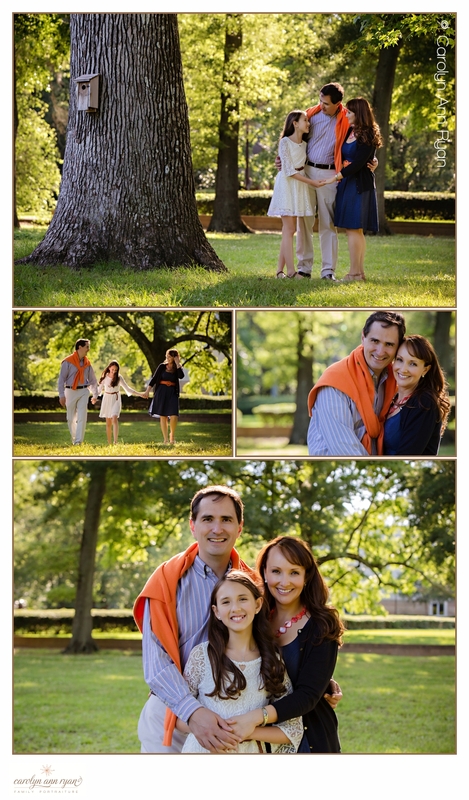 So your fall family portrait session is coming up and you don’t know what to wear. This is always a big challenge for my clients, because they know they are investing in the portraits and they want to love them. These are the photos that they will use for their Christmas and Holiday cards, and also to display in their home for many years to come and send as gifts to close family members. Visit my previous Gift Guide Blog Post here. The first thing I suggest to my clients is to look around their home, look at their walls and think about where they want to display their photos. They should consider both the style and decor in these rooms along with the colors. Is it a casual family room or a formal dining room or entry way? 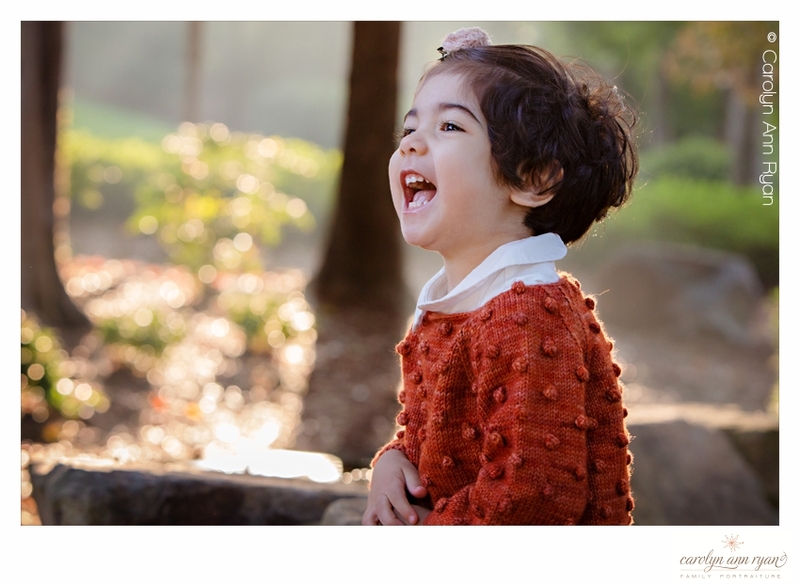 This will help determine how casual or dressy they would like to get for their session. For the colors, I always suggest that my clients use complimentary colors instead of having everyone completely matching. 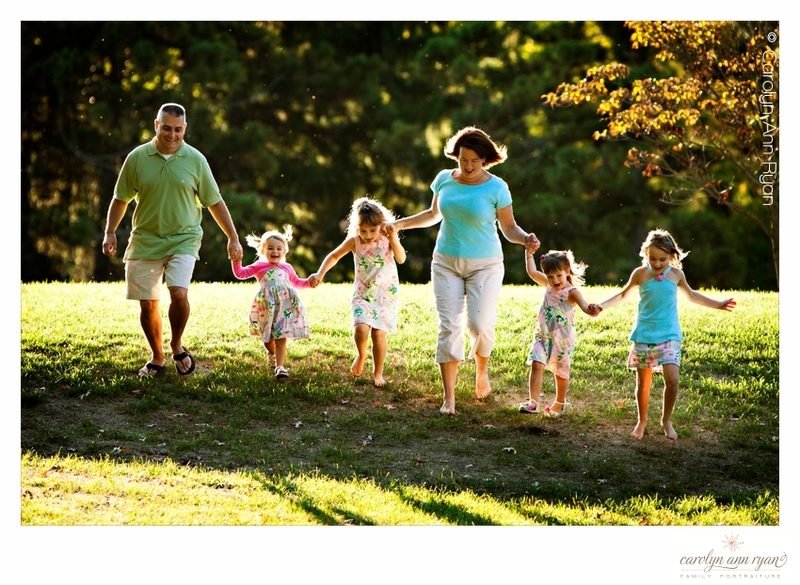 You want your family portraits to represent your personalities both individual and as a family. Incorporating the accent colors used to decorate your home will help your photos look best on the walls in your home. Weather can be unpredictable, especially during the Fall when the temperature swings can be pretty dramatic. 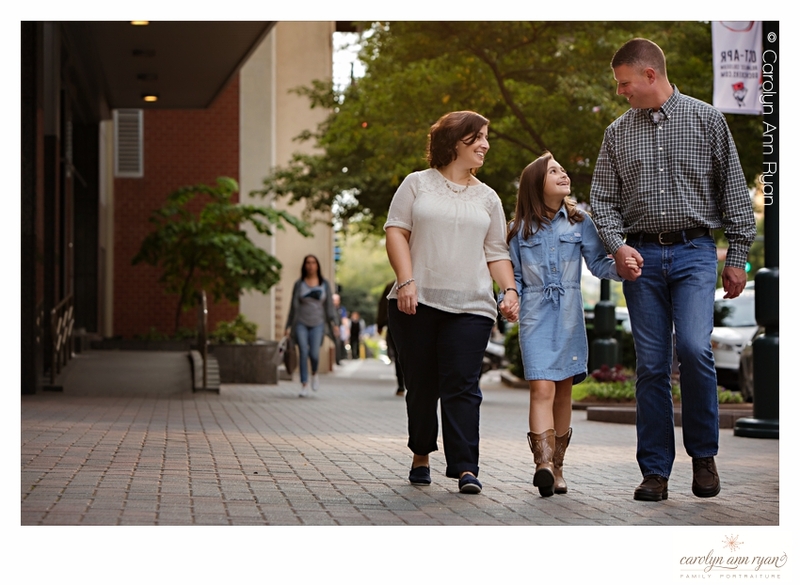 The temperature on your session day could be 85 degrees or 55 degrees, and that can make a big difference in keeping your family members comfortable and happy. So, I ask my clients to think about layers for their outfits. Are there jackets or sweaters than can be added where you would still be happy displaying the photos on your wall (which often means not their typical winter jacket or fall rain jacket). In the same respect, if you are planning for sweaters and corduroy pants, do you have a backup option if the weather is 88 degrees? It is difficult to keep children and adults happy if they are overheated on session day, so being flexible with outfits can be important. I LOVE accessories! 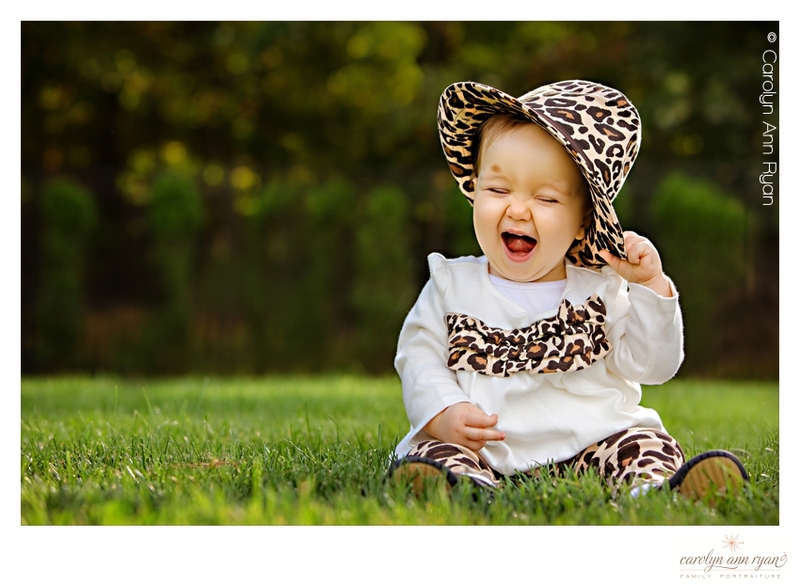 Whether it is hats, Trend Suspenders, vests or ties for little boys or hair bands, bows, hats and pretty shoes for little girls, the outfits can really make the photos stand out! Use accessories to show your child’s personality and to help tie your outfit selections together! 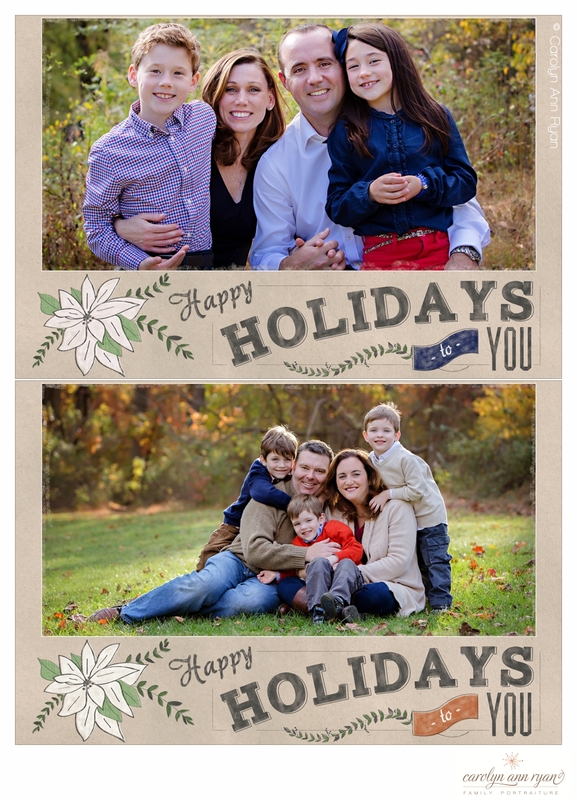 But what about my Christmas/Holiday Cards? Should we wear holiday colors? You can do a clothing change halfway through your session. Because yes, children are stinking cute in their holiday pajamas and your friends will just melt when they see your card! Ready to begin holiday shopping? 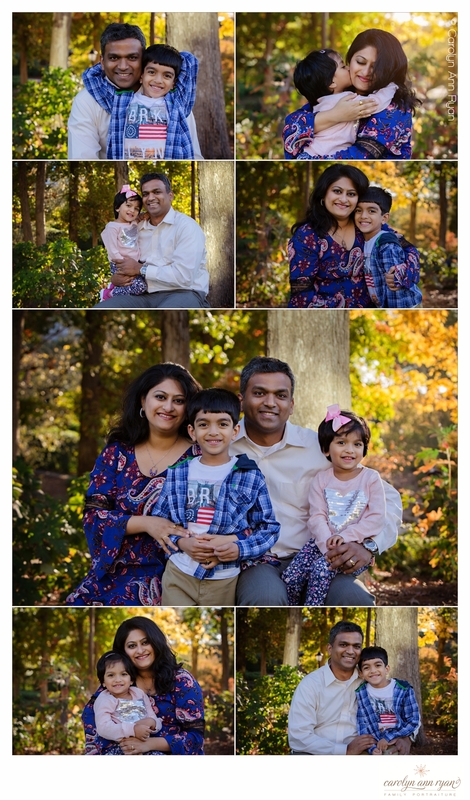 Fall is definitely the busiest time of year for family portrait photographers, especially in the Charlotte area of North Carolina. 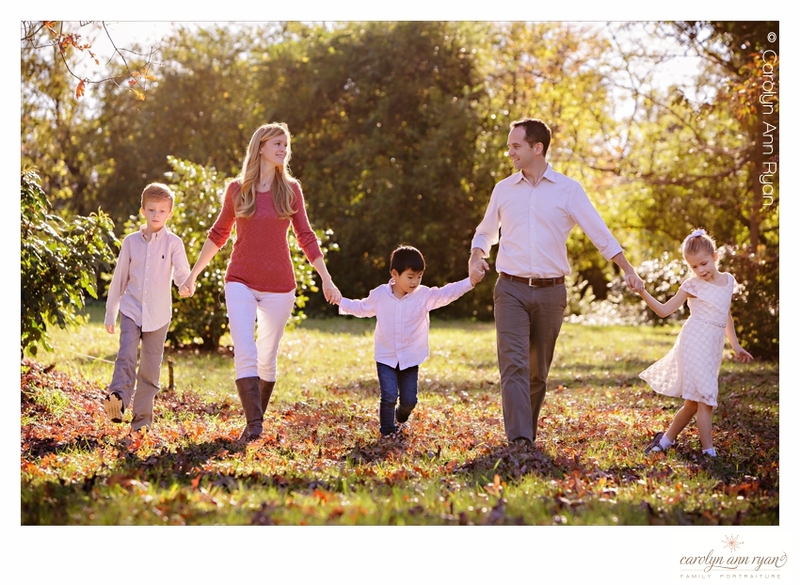 Most parents book their Fall Family photography session because they want updated photographs for their annual holiday and Christmas cards. 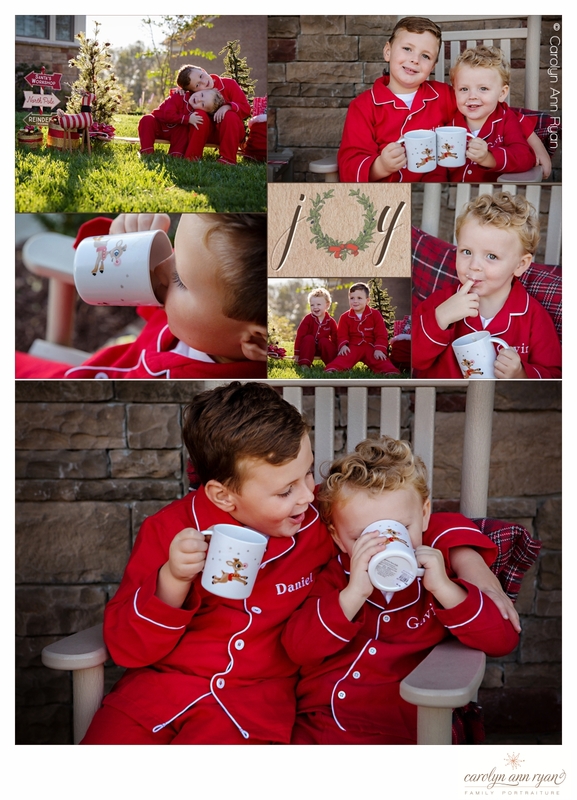 But I love showing my clients beautiful, unique and thoughtful holiday gift ideas for family members using their moments captured during our photo session together. These are such a great gift for grandparents or parents. 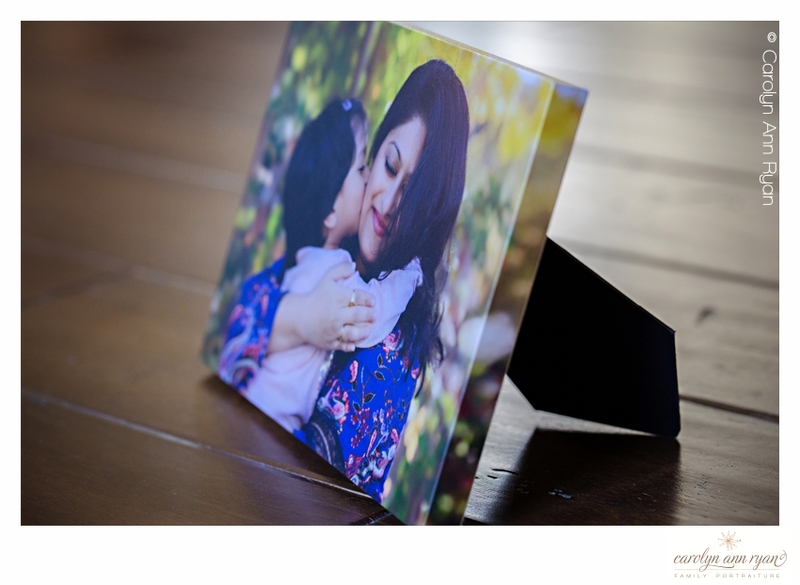 The print comes complete on a wood stand with easel, so there is no frame purchase required and therefore the print truly stands out on a table or desktop and will match any decor. 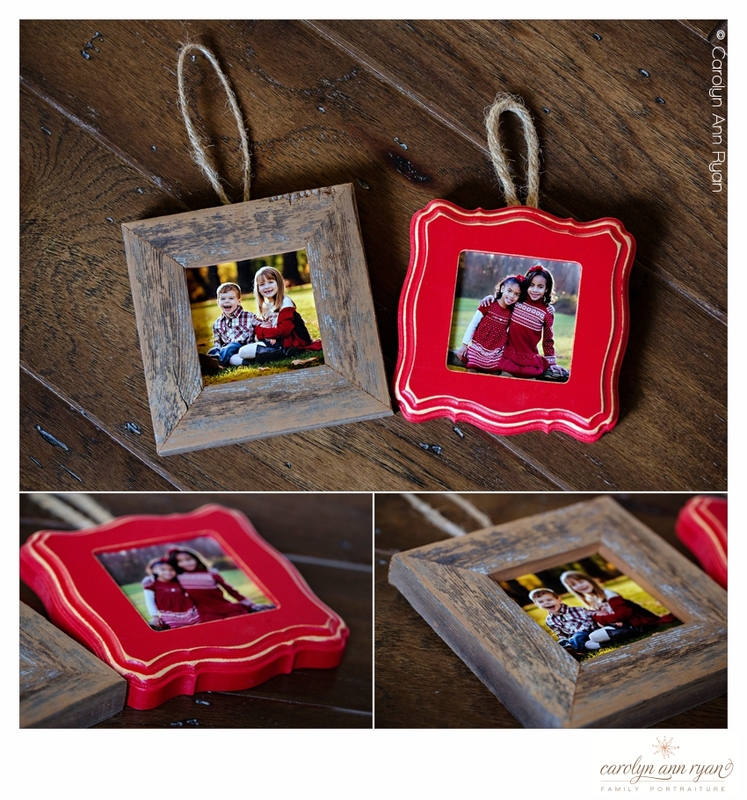 Grandparents will love adding these beautiful display pieces to their tabletop filled with photos of their grandchildren. We all know that grandmothers love having small photos on hand in their purse to show all their friends at the spur of the moment? Out to lunch with friends – look at my beautiful grandchildren! 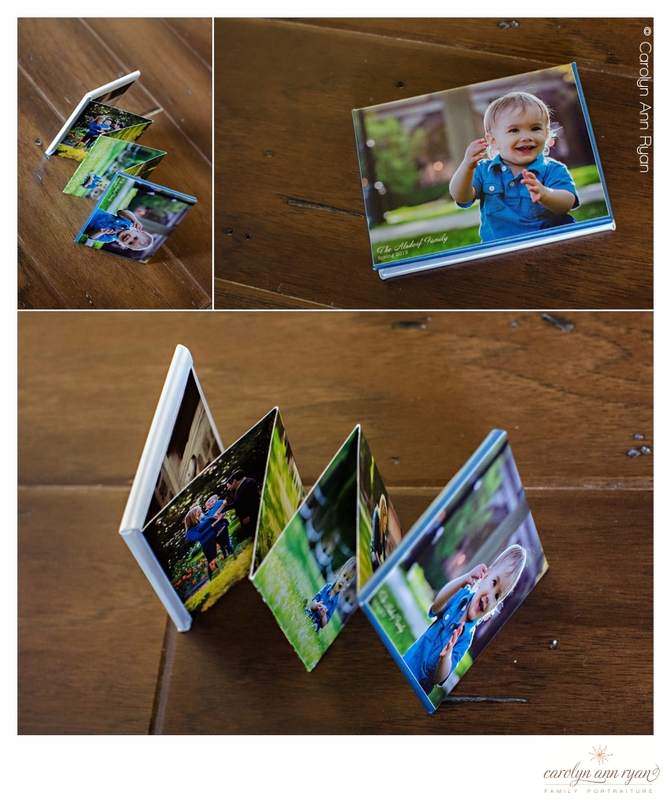 The accordion booklets have 10 wallet sized images on the inside and one on the cover and it’s a great way to get a bunch of your favorite images from your session. And since the accordion booklets come in sets of 3, there is always an extra for Mom to keep one for herself. 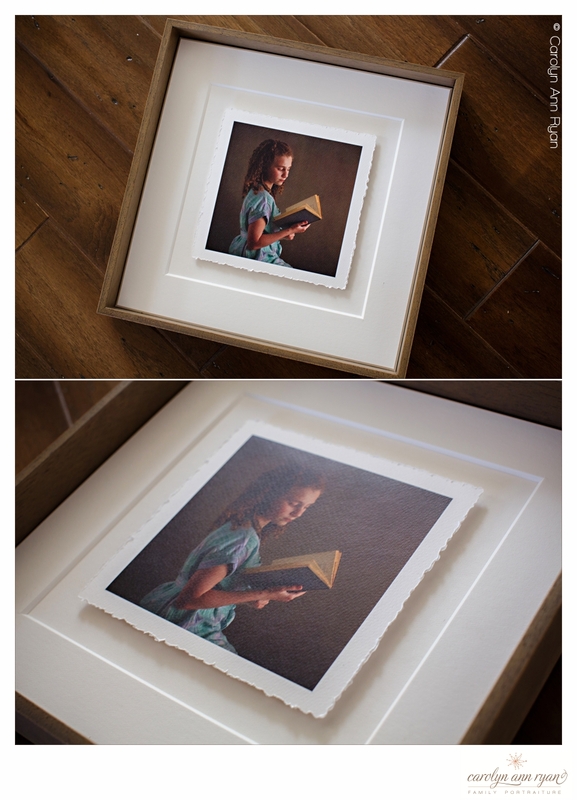 This is a beautiful fine art print with hand torn deckled edge paper that is mounted in a deep float-style frame with a white-on-white mat. The presentation is stunning and your image is truly the focal point. This is not your standard print in a frame and will make a treasured addition to the walls in either your own home or a grandparent’s home. These handmade Organic Bloom wood ornament frames are adorable and unique. Choose from either reclaimed wood or the custom painted frame to match the colors of your outfits. Whether hanging on your own tree or ordering for grandparents, aunts or uncles, these adorable frames will stand out among the many ornaments on display! 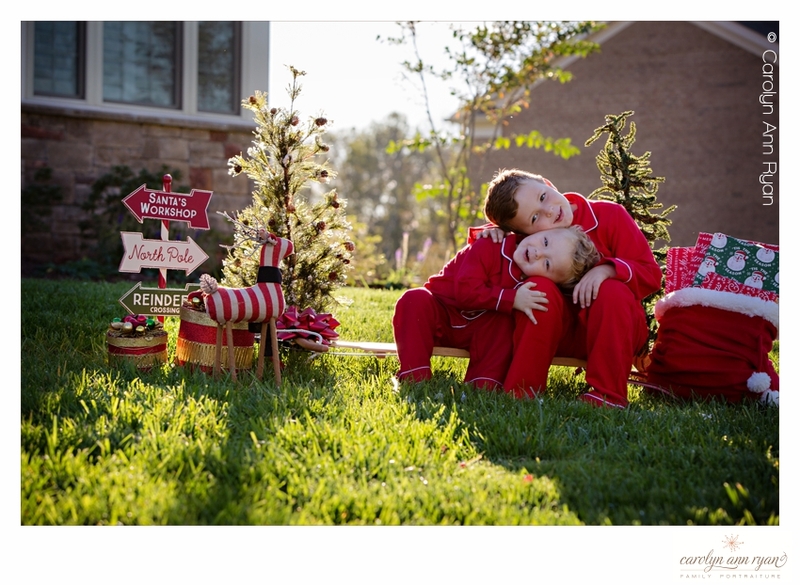 Each year, as you begin to decorate for the holidays, these adorable photos and frames will bring you back to the beautiful moments we created during your session. Personalized with 12 of your favorite photographs from your session, your magnetic monthly calendar can stick to the fridge, a file cabinet, or wherever pulls you. It has a month-at-a-glance view displaying one photo per month. This is another great gift idea for grandparents or Mom that will tug at their heart strings every time they walk by or grab a glass of water from the fridge. I have had one of these on my own refrigerator for the last 3 years, and my fridge would be incomplete without one. 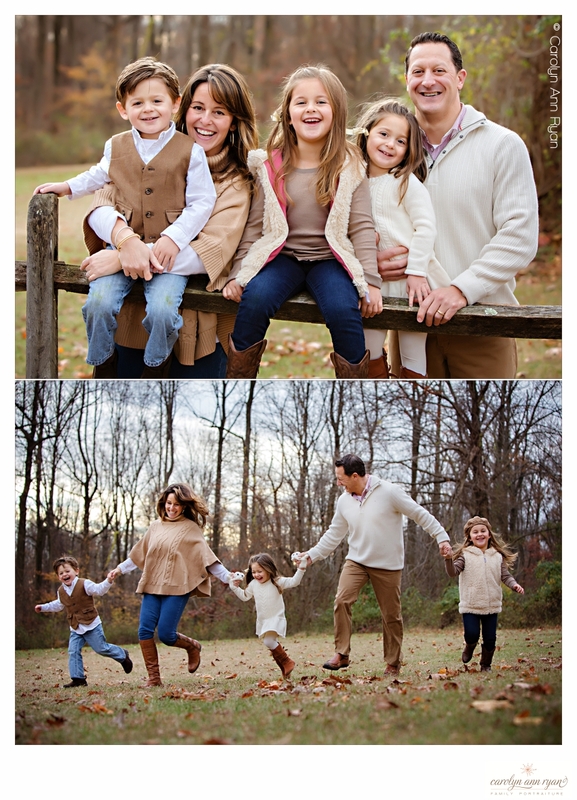 We are now booking Fall Family and Holiday Portrait Sessions! 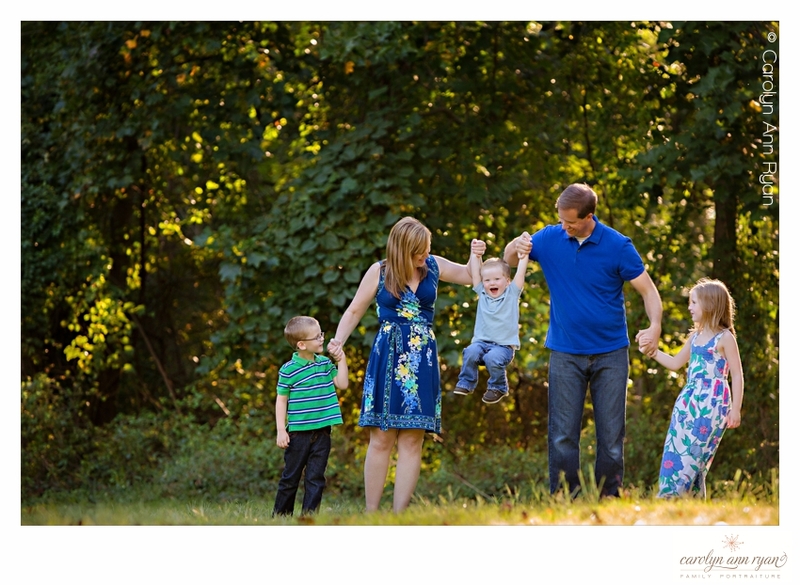 We would love to chat with you and help schedule a session for your family! 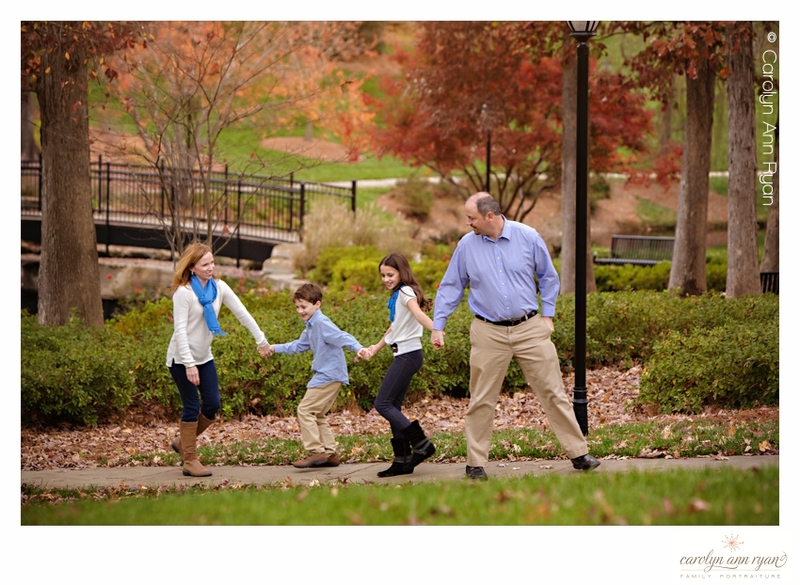 Please visit our web site at www.carolynannryan.com and call us at 704-256-7270. One of the lessons that I learned in my early years of family portrait photography came during a session with my own sister and her family. The lesson: As easy way to set the stage for creating authentic family moments with just a little instruction and a whole bunch of fun. 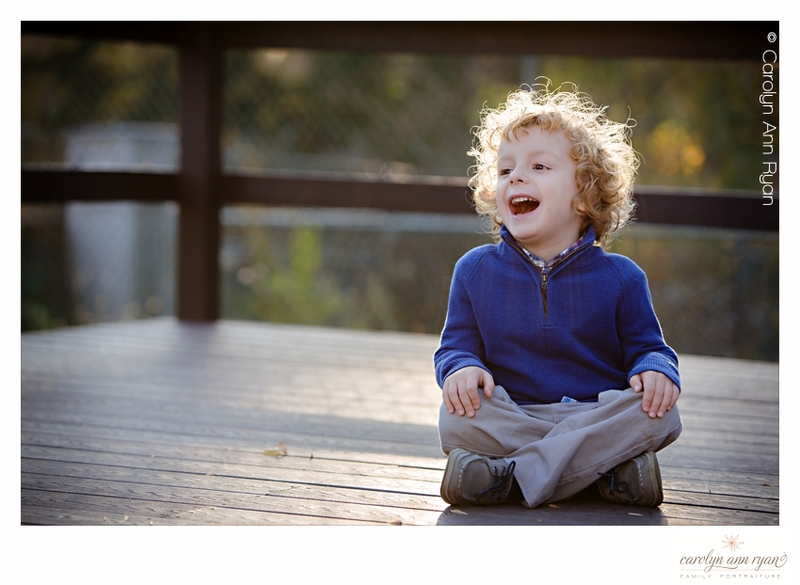 It was my very first year photographing families outdoors, and my sister and I scheduled a late Summer session. We had already spent two hours in a park and the kids were getting tired. 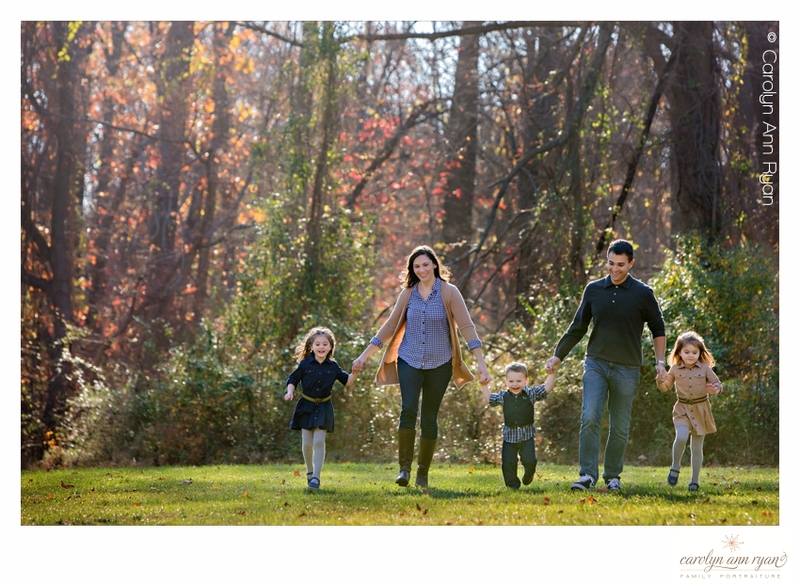 But I wanted a truly amazing photograph for my sister of her whole family. My sister looked at the hill nearby and said “If you want a photo of all the girls smiling, let them run down that big hill over there”. I looked to the hill and I saw the light, and I mean literally – the light was stunning. So, I sent the whole family up the hill while I laid down in the grass at a distance. 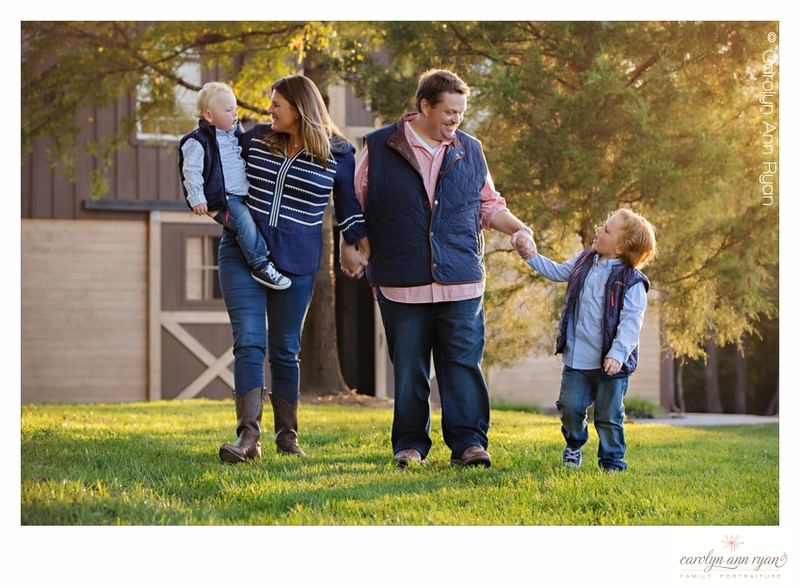 The whole family went running hand in hand down the hill and the smiles and giggles followed and an authentic family moment was created. This photograph was created in September 2010 and a beautiful canvas print of this image still hangs on my sister’s wall in her family room. 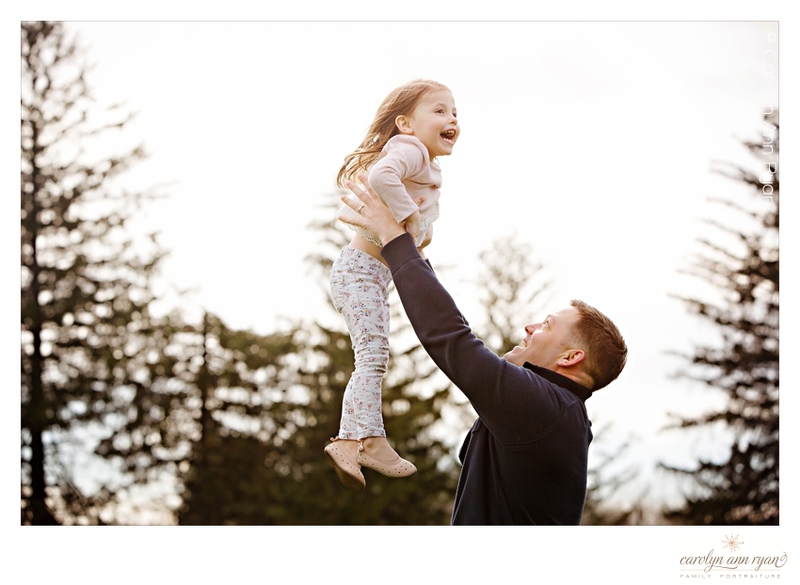 As I have been compiling favorite moments over the last few weeks, I realized that some of my favorite photographs from my clients’ sessions are created in a very similar way. But as you scroll through this list, you can see how a simple idea can highlight a family’s unique personality and create a beautiful and even magical moment in a classic photograph. So here are my . . .
11. I love how happy this family looks together. And their outfits paired perfectly with the beautiful rust colors of the foliage. 10. 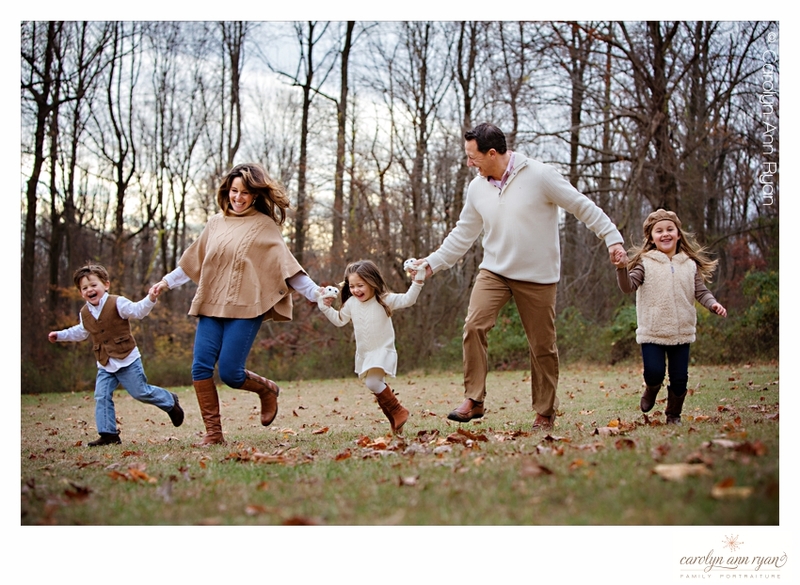 Running through a field in the fall can certainly bring smiles to the little ones. This photograph has occasionally been featured on my business cards. 9. Beautiful spring session with hair blowing in the breeze and Dad making everyone laugh. 8. The wonder of childhood. I love how Mom and Dad adore these little guys. 7. I have always loved how the expression on this little man’s face, as well as how the whole family focused right on him. I wonder if he still loves to steal the show. 6. If you have been to my studio office, you are familiar with this family and the cluster of photographs on the walls. I adored their energy and spirit. So much fun and giggles, despite the November chill in the air. 5. There is a sweet dreaminess to this photo, and I’m just waiting to see the enchanting young lady begin her twirl. 4. 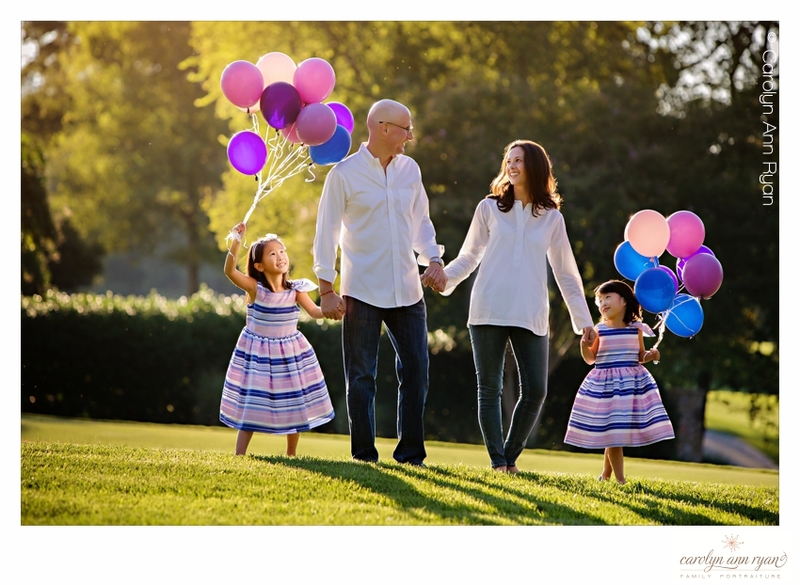 I love the outfits, the balloons, that beautiful pop of color against the sunlight and the incredible connections captured within this sweet photograph. 3. Sometimes, you gotta go your own way. 2. And yes, this little man agrees and he will choose to lead, not follow. As I relocated to Charlotte two years ago, this one holds a special place in my heart. The family was one of our first Irish Dance friends after relocating and I love how much their adore their sweet girl. And while I don’t normally love having other people in the backdrop, seeing a person in a Panthers T-Shirt truly fits this city. Charlotte loves the Panthers, and Charlotte is home. 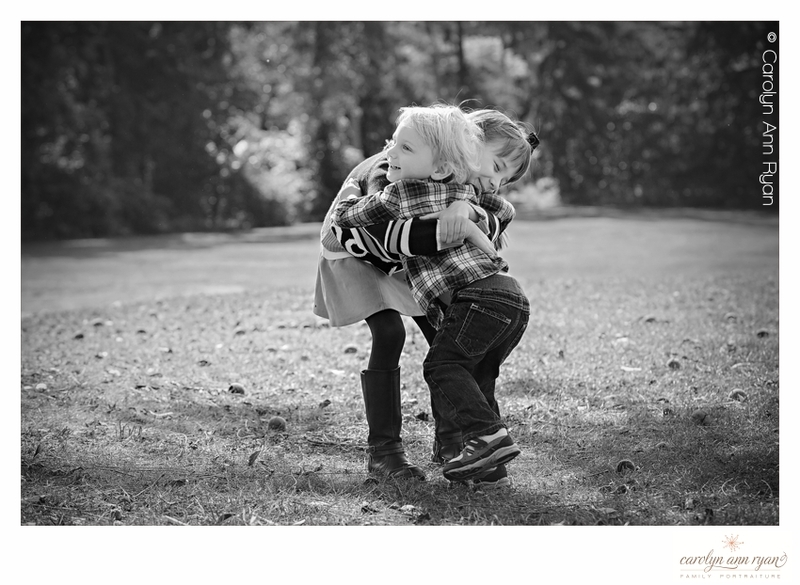 If you enjoyed this list, please check out my Top 12 Moments of Joy and Top 10 Sibling Hugs. 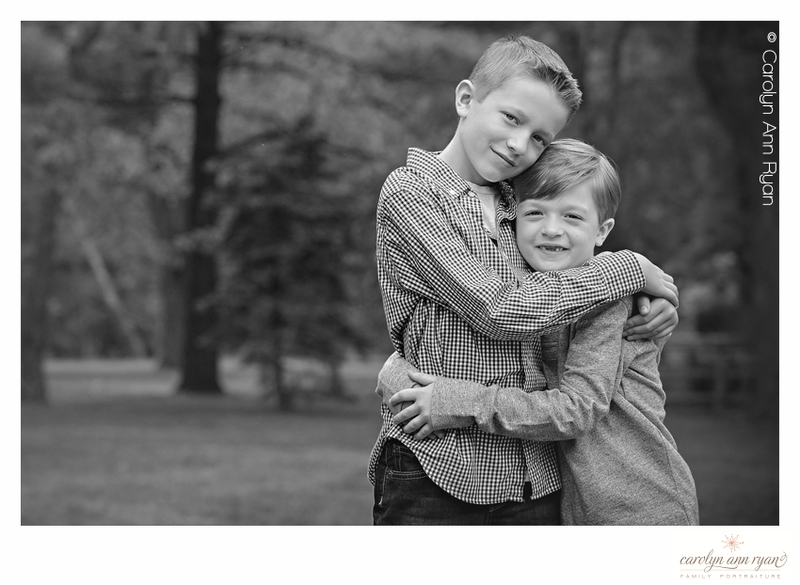 Earlier this week on the blog, I shared my Top 10 Sibling Hugs from previous client family portrait sessions. Today, I want to help kick start your weekend with great big smiles and joy, therefore in today’s post I’m sharing my Top 12 Moments of Joy! These open mouth smiles from the youngsters are genuine moments from my portrait sessions and have always brought sunshine to my days. Can you almost hear the happy squeals of joy and giggles from these little ones? 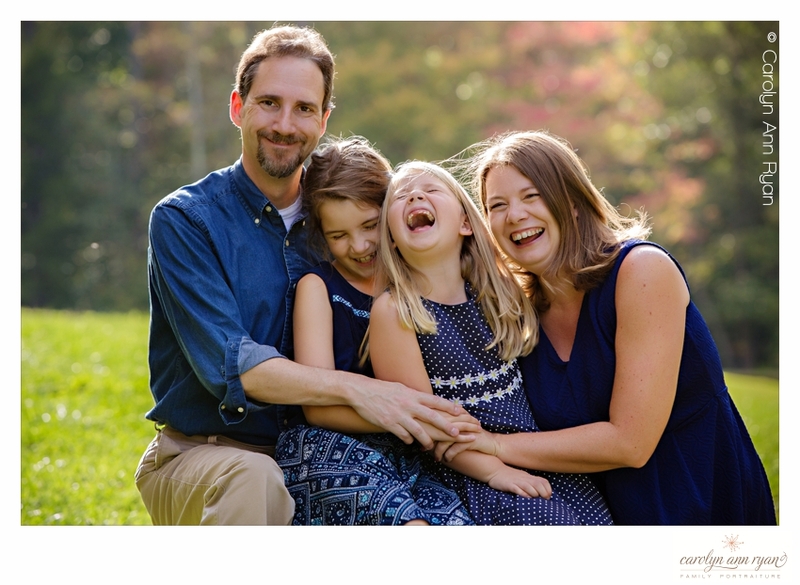 My goal for a family portrait session is always to make it as fun as possible while capturing some of the best images my clients will have for years to come. 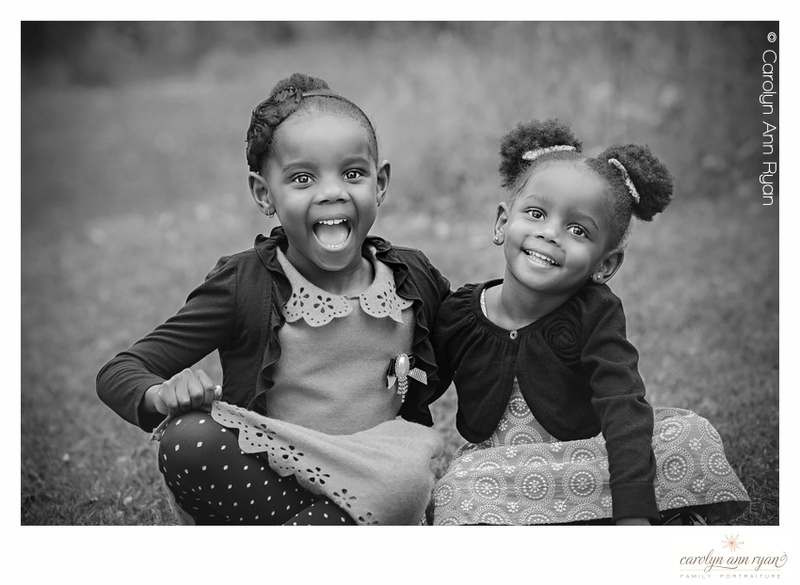 I can only hope that these adorable little faces represent the true experience of what it means to work with Carolyn Ann Ryan Photography for a family portrait session! I wish that your upcoming weekend will be filled with moments containing this much joy and happiness. If only we could find a way to bottle up the joy of childhood and share it with everyone. “You can’t give a hug without getting a hug”. 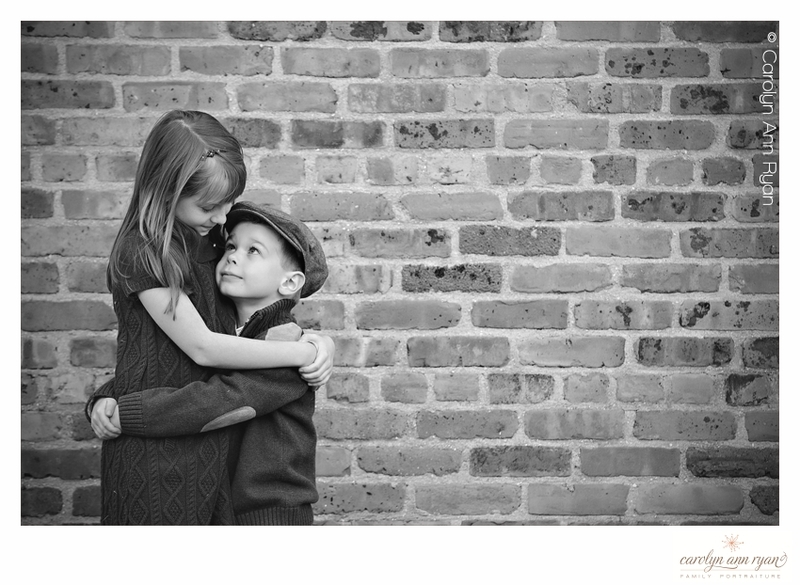 There is something about a photograph of a hug shared between children that just warms my soul. And I love how asking kids for a simple pose during a family portrait session can often turn into truly endearing and heartwarming moment. 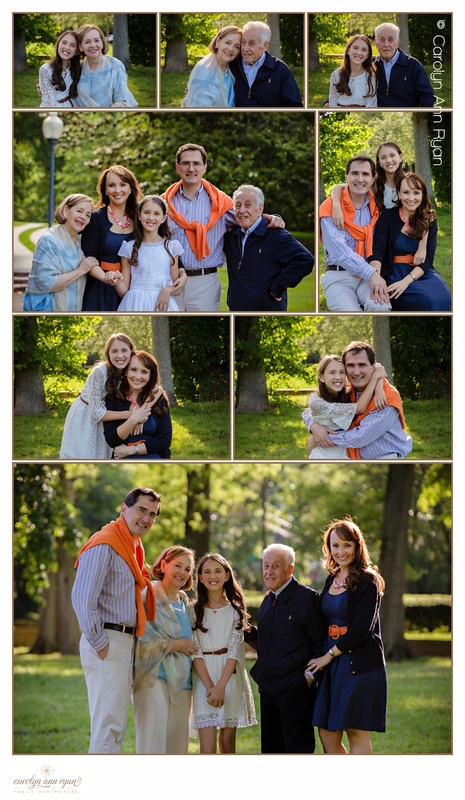 Over the last few days, I have been going back through images from the last few years of family portrait sessions, and I have truly enjoyed remembering these treasured moments. 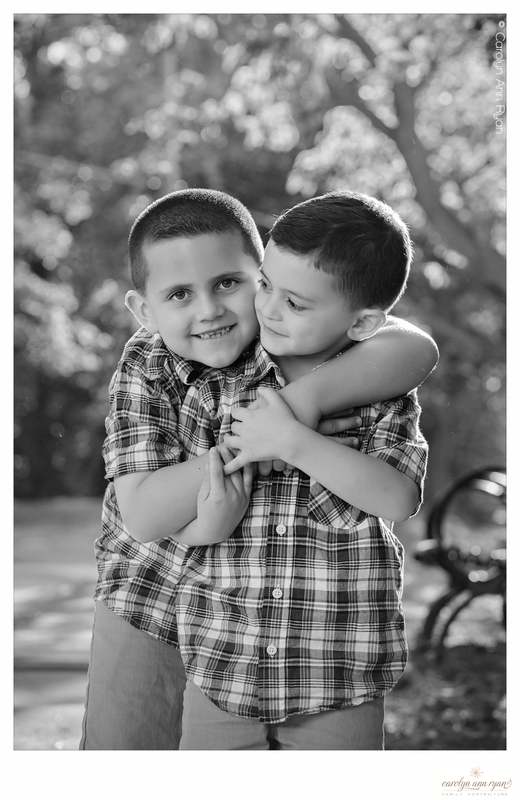 With each session, there are a handful of images that have become personal favorites. It could be a funny moment, an adorable giggle, or an incredible hug that just takes me back to the moment I clicked the shutter of my camera. 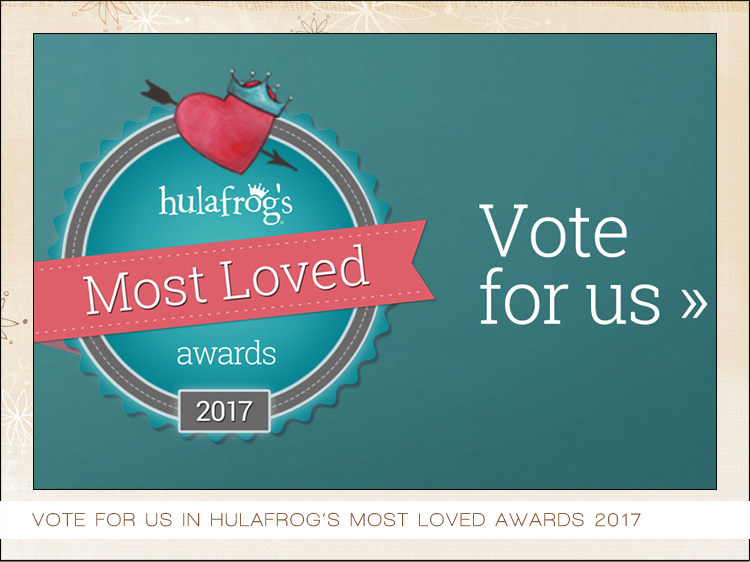 I’ve started organizing these precious moments into categories and I would love to begin sharing my favorite Top 10 images for each category on the blog. 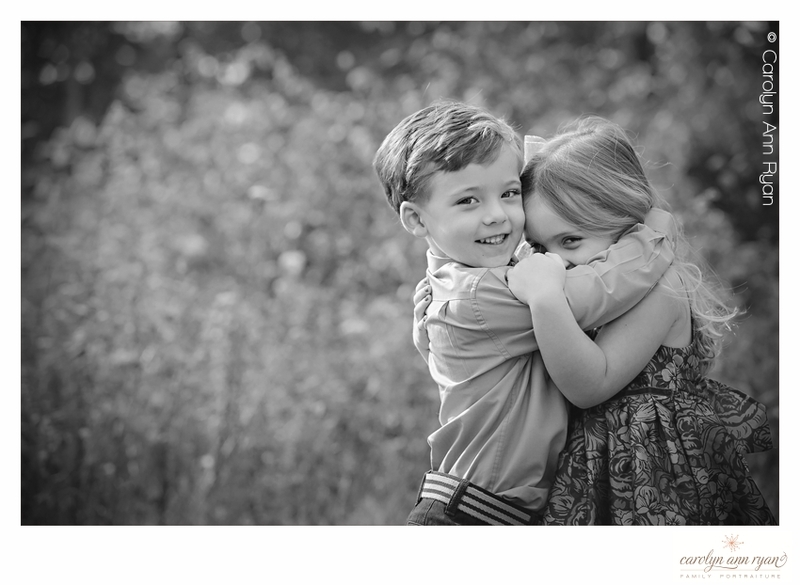 So, today I’m starting with my favorites in Top 10 Sibling Hugs. 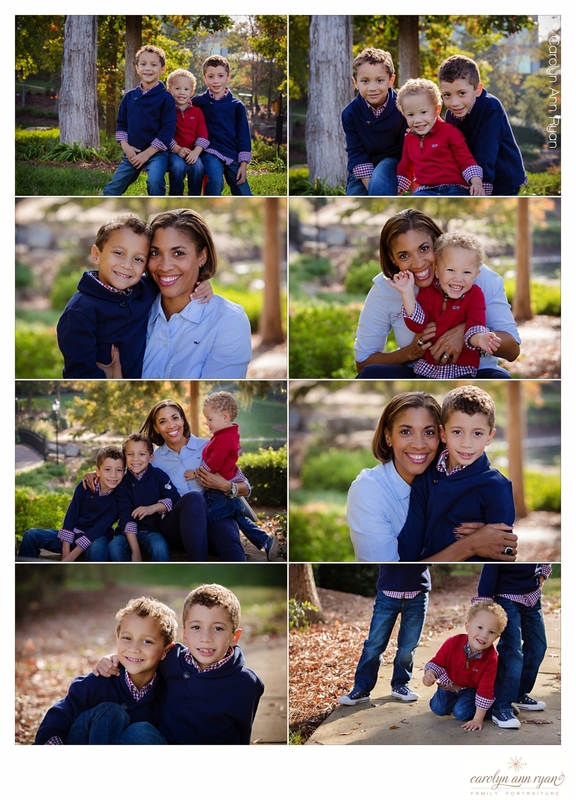 All of these images were captured during a family portrait session with my clients from the last few years. I hope you won’t be able to resist smiling while viewing this list of photographs, and may it warm your heart as much as it does mine. It is said that hugs are like vitamins for the soul, and looking at this list, I completely agree. There is no greater friend than a sister. Even when sisters don’t see eye to eye, they will still always have your back and always be there when you need them most. When you squeeze so tight, you have to close your eyes too. I love that you can just see the adoration on this little man’s face and you can just tell how much he adores his big brother. Older siblings adore their little siblings too. 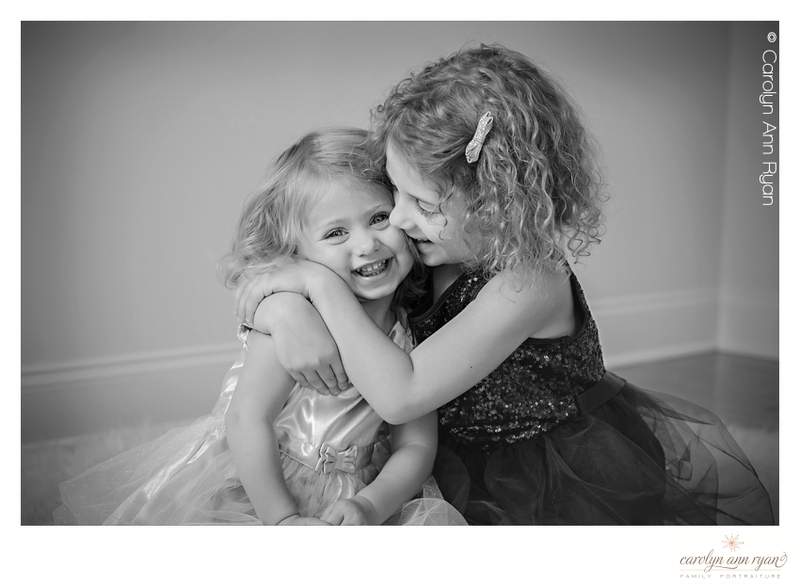 Big sister can’t resist giving her little sister a kiss on the cheek with her hug. 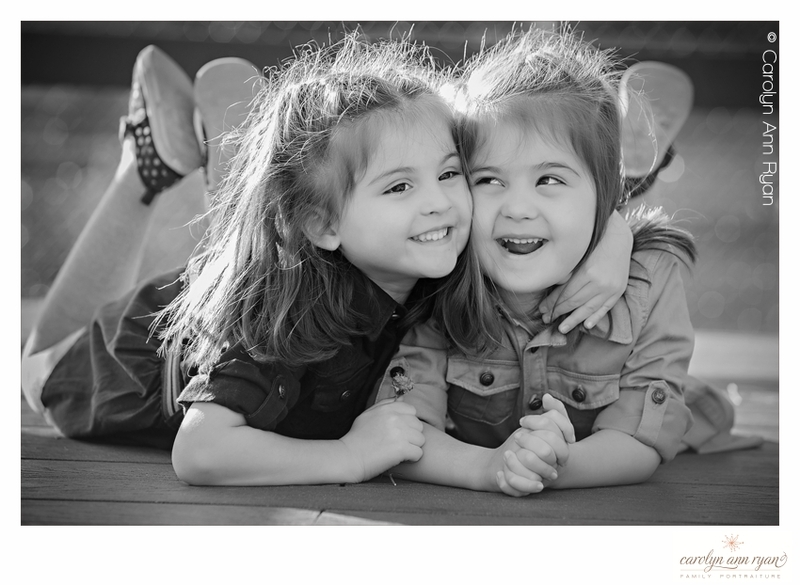 These two sweethearts were super giggly during their entire photo session. I remember that my cheeks hurt from smiling so much on the other side of the camera. 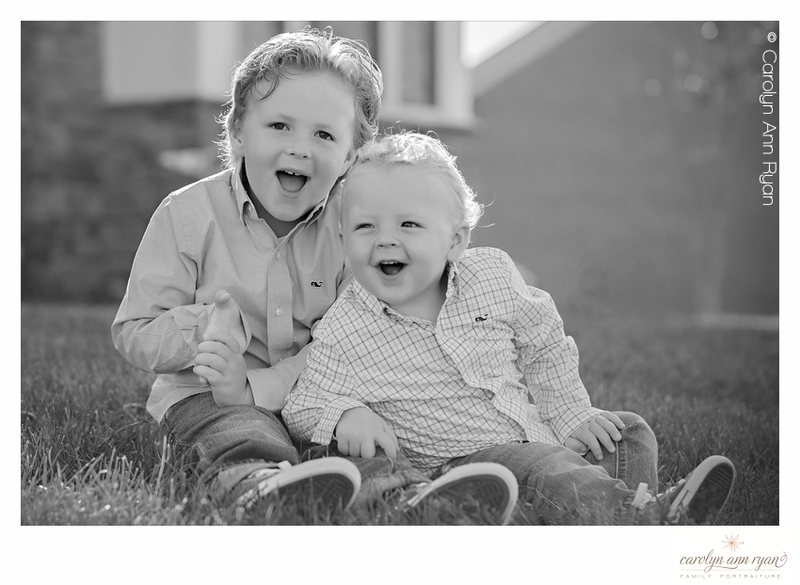 These boys just have the perfect, simple and sweet smiles to draw you into this moment. 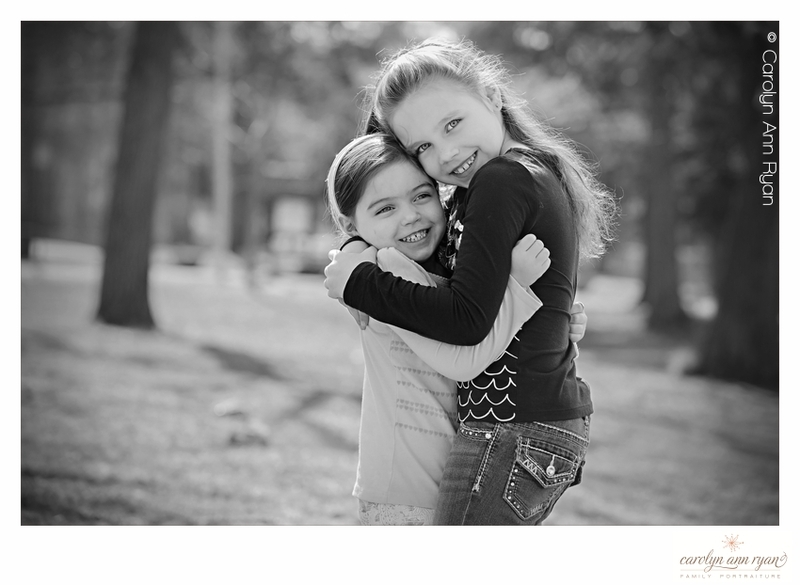 I love getting my clients’ faces close together for family portraits and these girls definitely have the right idea. I love hugs like this one between siblings. I certainly remember the stage of my own children’s life where my daughter always hugged my son around his neck and you couldn’t see his face. It’s just how they hugged at that age. Big sis loved this little guy so much. You can just see on her face that she never wants to let go of his adorable hugs. It’s photos like this that make you want to stay wrapped in a moment forever. 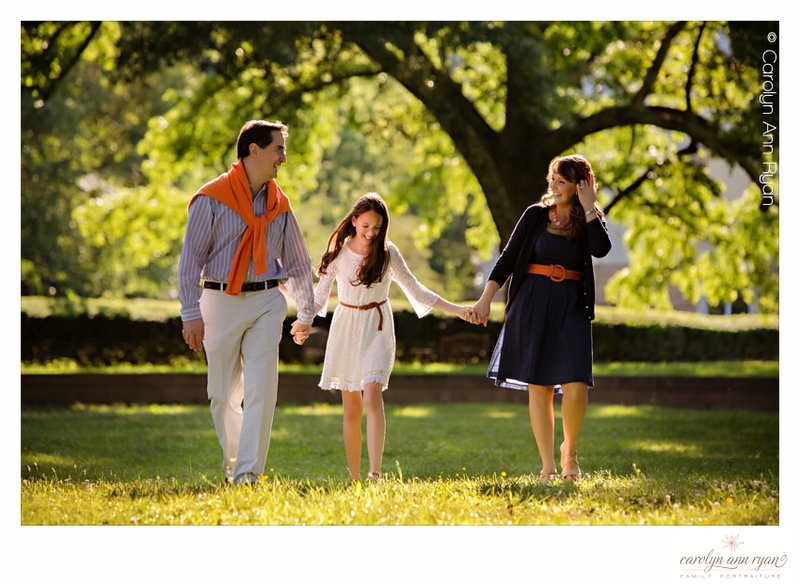 This session was photographed in front of the client’s home in North Carolina. And if these boys weren’t already cute enough, when I asked them to hug, they just leaned into each other as if they could take a nap all curled up on each other. It’s not fair to list in the Top 10, but I will forever love this moment and this hug and have it framed on my wall. This photograph is already almost three years old and as my children grow older, I want to always remember this perfect sweetness. And I just want to scoop them both into a great, big forever Mom hug and never let go. 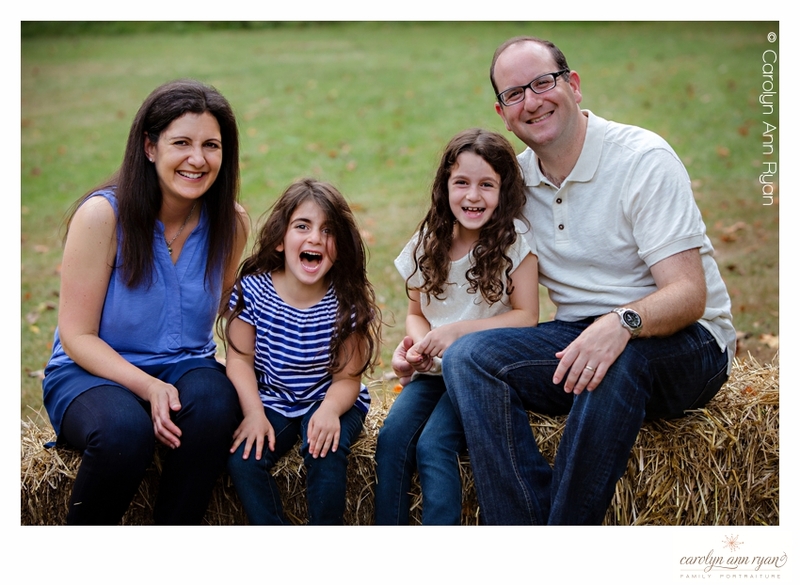 I strive to be the MOST prepared Family Photographer for my clients, and with over 8 years of experience photographing families, I thought I knew everything I should bring in my car and camera bag to a family portrait session. While there is very little I am unprepared for, after each tiny mishap or snafu over the years, I have added to my personal photographer toolkit, so I am prepared for the next time. Fill up your gas tank in your car the night before your session. My dear friend, Willy Wilson, from Life Unstill Photography in Colorado, shared this little tidbit recently. We won’t confirm or deny if Willy was ever so worried about almost being late for a client session, that she pulled away from the gas station with the gas pump nozzle still attached to her car! Either way, save yourself a bit of worry and make sure that gas tank is full before you venture out to your location. When you are on location with young children in a park or field, a toilet situation might arise, and there isn’t always a bathroom near. Don’t let poor parents get stuck in this situation. I keep a small “travel potty” in my SUV for these emergencies! I love this one on Amazon, and includes simple zip closure bags for easy clean-up. Keeping a fresh stock of baby or cottonelle wipes in the car is also critical for these situations, as well. I once arrived at a session, and as I was unpacking my camera equipment, I hear a Mom shout, “WHAT is in your hair?” I lean over behind my car, and the mom simply says to me “Gum. In the hair. By any chance do you have a pair of scissors?” Thankfully, it was not in the child’s bangs, and I was also grateful that I happened to have a small pair of scissors in the car. (It’s a mom car, so there are days I think you could find anything in it). Well, boys will be boys sometimes. 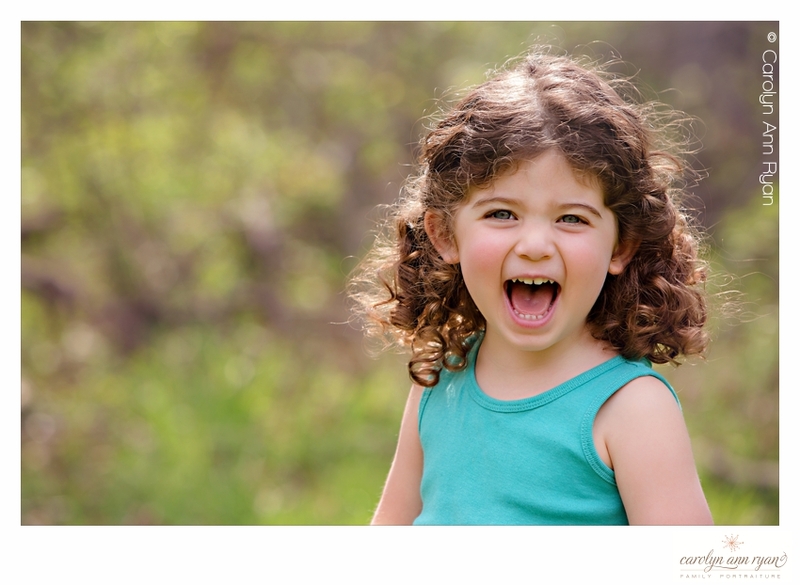 As Sheena Magnesen from SMM Photography shared that her clients once bumped heads during a leaf throwing incident and one poor little boy got a bloody nose. Sheena acted quickly and grabbed the nearest item possible to help prevent the blood from staining her little client’s new clothes, and I’m sure this little man still remembers the day he had to hold a (clean) diaper under his nose at the end of his family’s portrait session. Beth Seliga from 3 Cats Photo in Virginia always keeps a spare sheet and clips in her car, so she can create a personal on location changing room with privacy for clients in the back of their car. This comes in very handy for Senior portraits sessions. Sometimes, the bugs just start too early! I think this upcoming Spring and Summer will be especially problematic due to the mild winter in many states, so definitely keep those handy. I personally LOVE the OFF Deep Woods Towelettes as they are small enough to toss a couple in my ShootSac and you don’t have to worry about them spilling. And this year, I’m going to try a chemical free product from PureStella Skin Care – The Bug Off Lotion Stick! And if a bite does occur, I LOVE the Benadryl Cool Relief Gel. This particular product, unlike most benadryl products, is free of diphenhydramine hydrochloride, so it is safer for younger children ages 2+. But please, ALWAYS confirm with parents before applying and ensure children do not have particular contact allergies. Sheena Magnesen from SMM Photography also keeps dryer sheets in her camera bag because you never know when you need to remove static cling! When little ones arrive on location for their family session with temporary tattoos on their arm from the street fair the day before, you will be so happy that you had a handful of alcohol swabs in your bag for easy removal. They also come in handy in case of minor cuts and scrapes. Most of the photographers noted they kept small nut-free snacks in their bags. With parent permission, these can really help with a needed boost halfway through the session. Included suggestions: Smarties, Welch’s fruit juice treats or graham crackers. 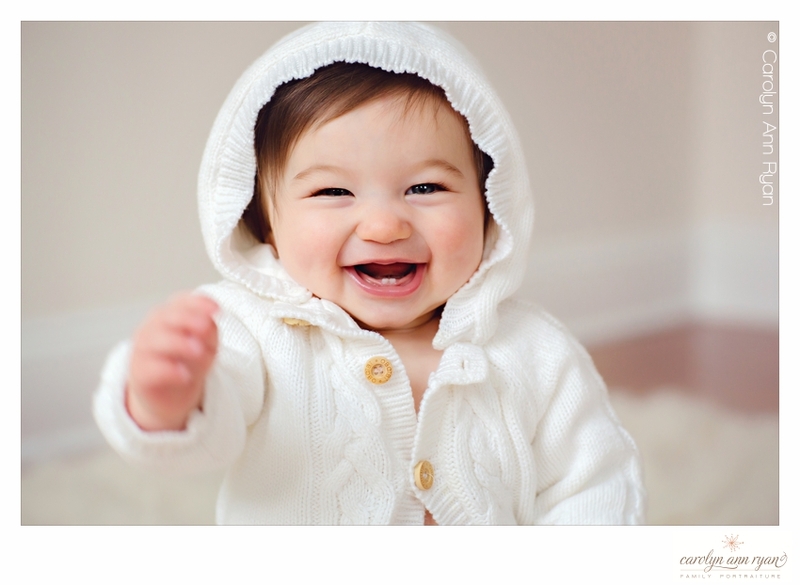 Every once in a while, it may take a little more effort to get a shy or stubborn little one to open up and give us their best smile and giggle. Kimberly Tank from Kimberly Tank Art & Photography is so excited to use her whoopie cushion this year to encourage a few bursts of laughter! I can’t wait to see the photographs that result from this addition. Angela, Willy, Sheena, Kimberly and Beth all suggested keeping a small pouch in your camera bag that included lint rollers, hair spray, bobby pins, stain remover wipes and more. 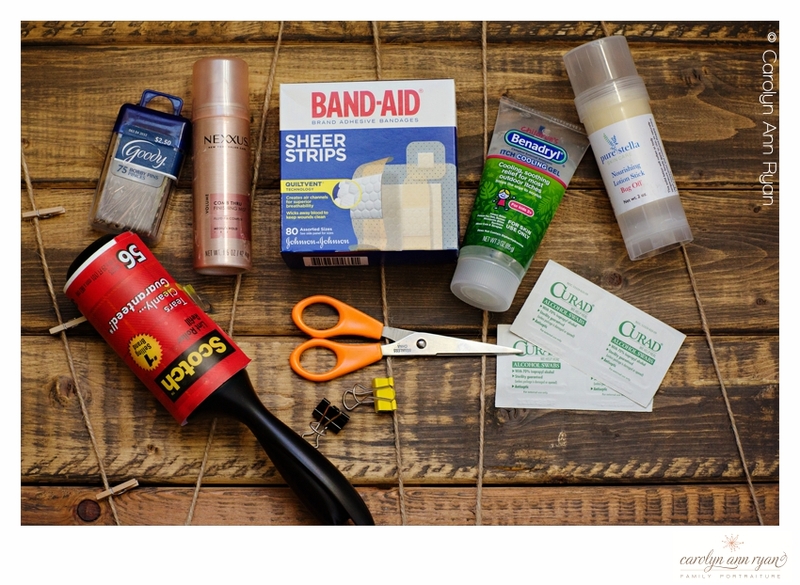 You never know when you will need this emergency kit, and your clients will love that you are prepared for anything. I know I have a few purchases to make to stock up my car and camera bag kits. What will you be adding to your kit this year? Did we miss anything? Please let us know in the comments! 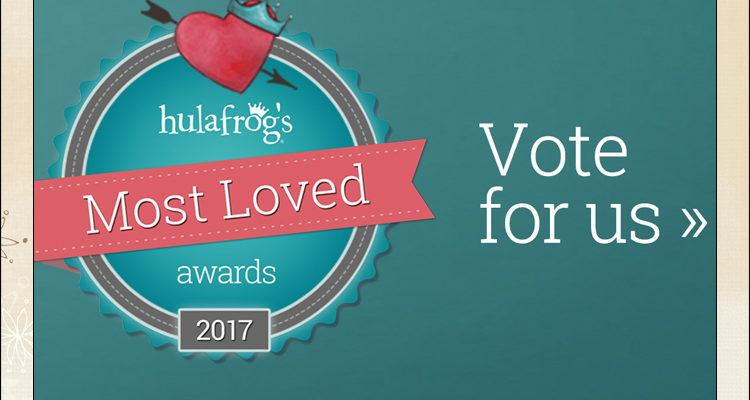 Most Loved Charlotte Family Photographer | Thank You for Your Votes! 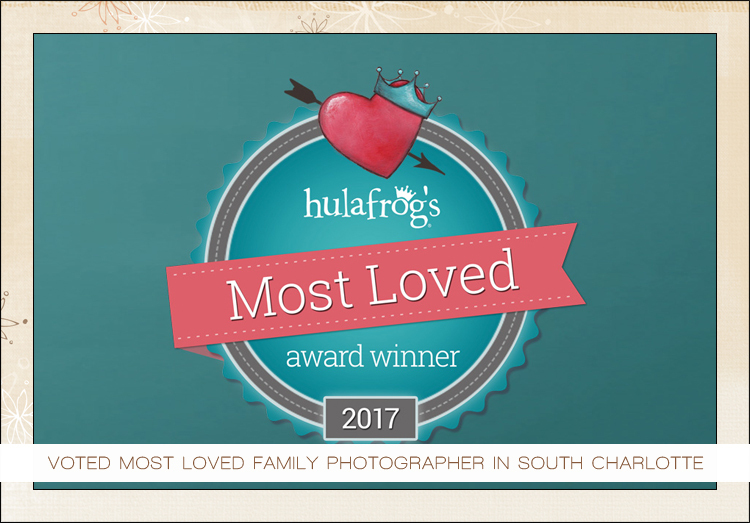 Earlier this week, I received notification from TWO local family email newsletters that their readers have voted Carolyn Ann Ryan Photography as their Favorite Family Photographer in the South Charlotte area for 2017! I can’t thank my clients and friends enough for taking a moment to vote in each of these newsletters. Your votes mean so much to me. I absolutely love my job and have truly enjoyed working with my clients, and I thank you all so much for choosing me as your Favorite and Most Loved Photographer. 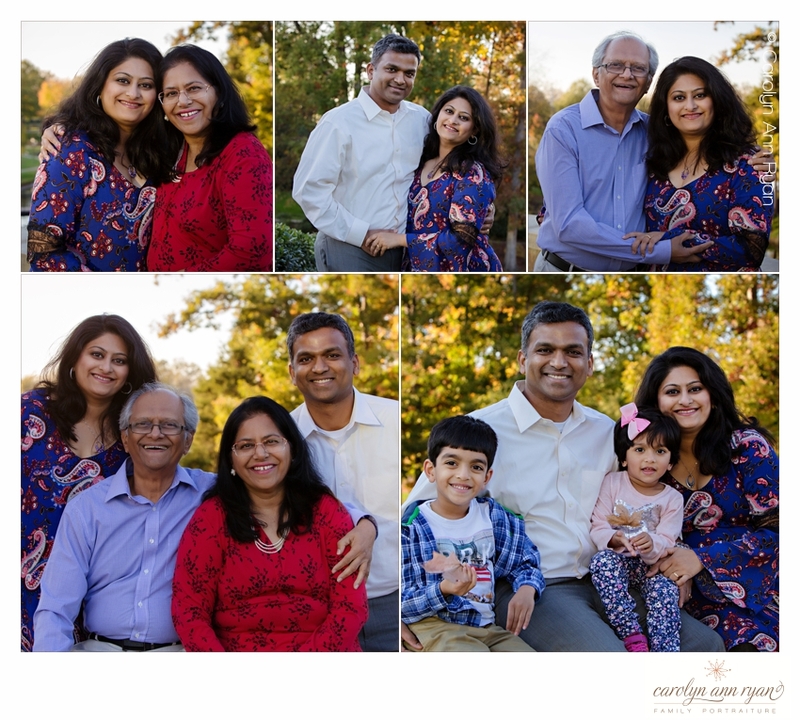 If we haven’t worked together yet, and you would like to learn more about booking your family’s portrait session with Carolyn Ann Ryan Photography, then I welcome you to visit our web site, join our email list to learn about upcoming session options and dates, and call us at 704-256-7270. It’s that time of year again – when I feel like I’m campaigning to win a middle school student council election. 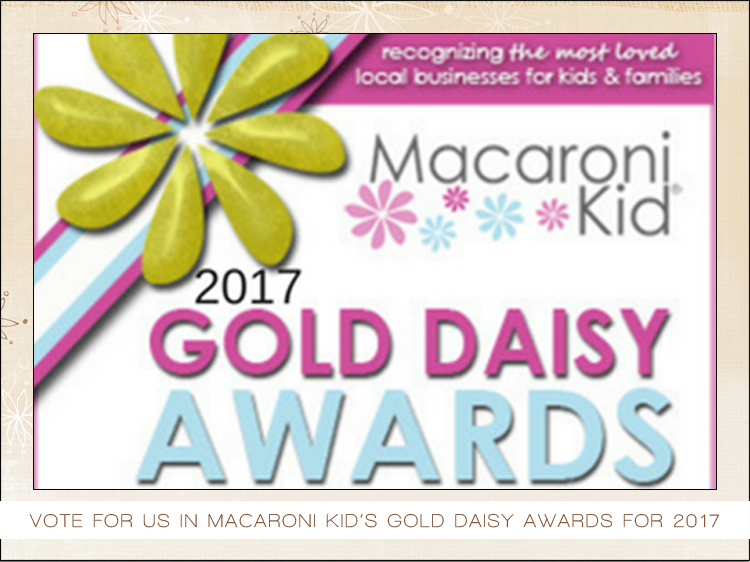 But truthfully, I’m extremely honored to be nominated in TWO local newsletters in their categories for Favorite Family Photographer and would be truly ecstatic if my business got your vote! Thanks in advance for your time and for all of your support! 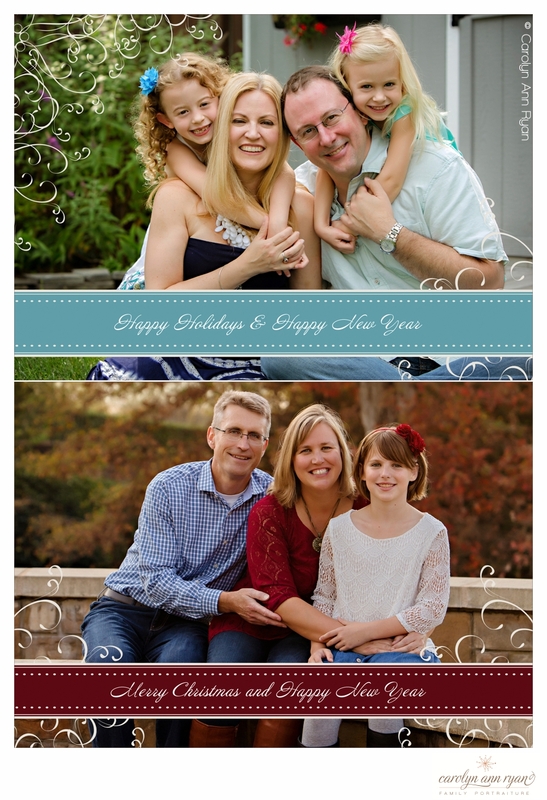 And thanks so much for your business and continuing to follow along with Carolyn Ann Ryan Photography! I greatly appreciate it. 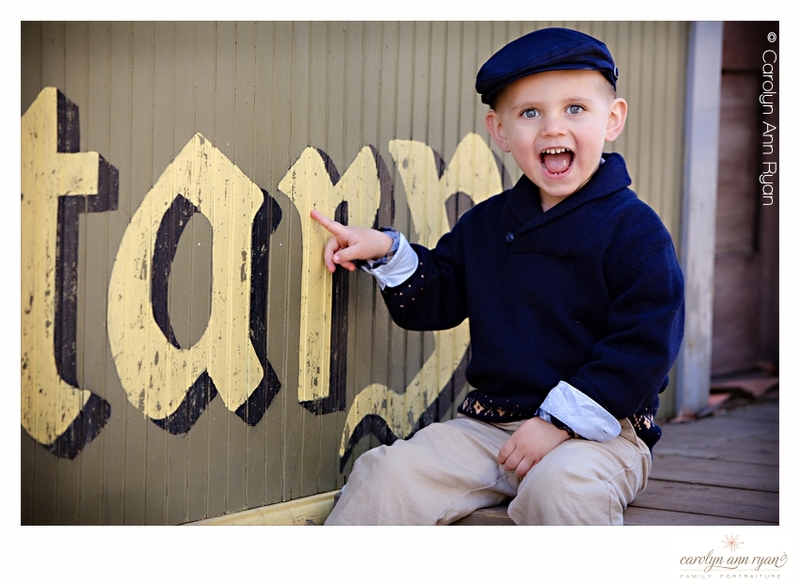 I absolutely love hearing the following words from my clients: “You’ve captured each child and their personality perfectly!” When a mother can look at a photograph of her child, and not just see how cute he or she looks, but their entire personality shines through and she feels that you have captured exactly who they are as a person at that point in time – that’s gold! It’s truly music to my ears, and lets my heart know that I did a good job for that Mom – I did MY job. Our children grow so fast, but inside each one is so unique and distinctive. 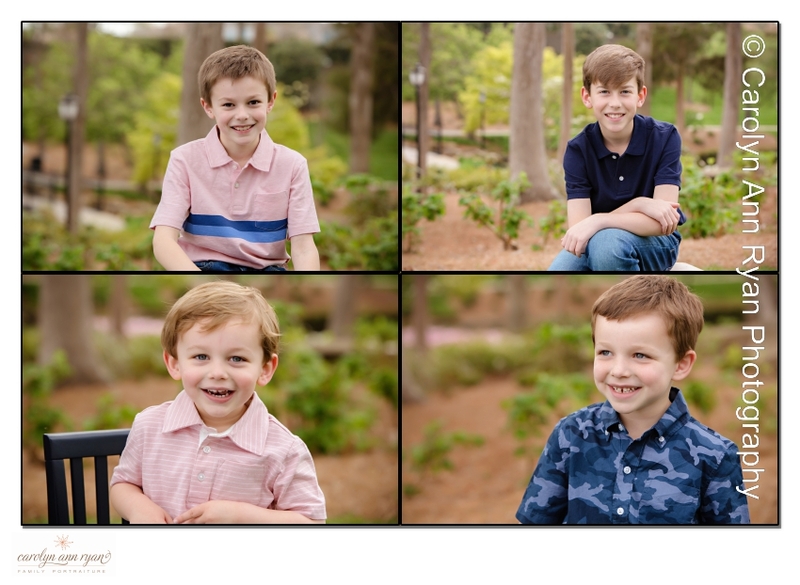 They may have similar physical features on the outside, and it may be easy to tell when three boys are brothers, but their likes and dislikes are all their own. 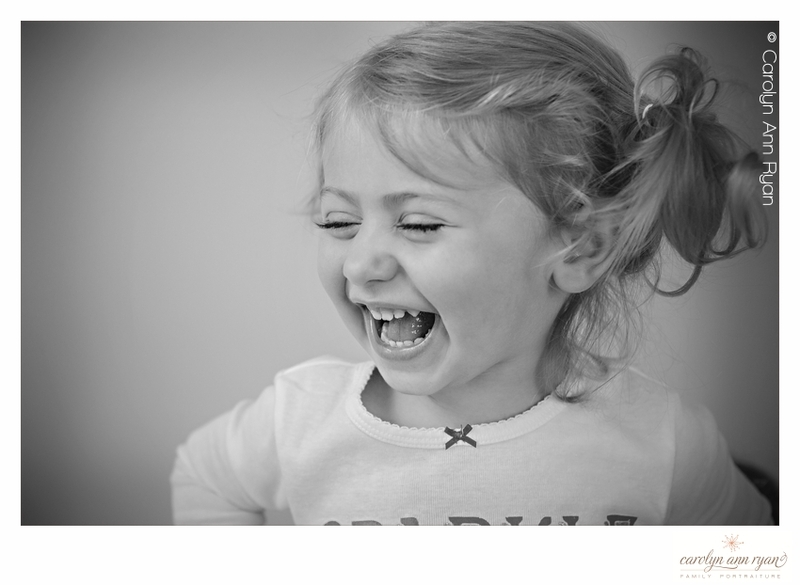 This is one of the reasons why I love doing pre-session consultations in advance of my portrait sessions. It’s a chance for me to find out which child loves cars or trains, and which child loves playing basketball or baseball. Believe it or not, it’s important to know if your little man loves Team Cap or Team Iron Man, because it helps them warm up to me, and their eyes start to light up when you start talking about their favorite things. And it’s equally important to know what might make them giggle or laugh, which I will fully admit, when it comes to boys that can often mean potty sounds and noises. So, yes, I might need to ask your child which member of the family has the loudest or smelliest farts. (But I only ask these questions with mom’s permission and that’s another important part of her pre-session consultation). It’s all part of the job, and getting to know the adorable, unique personalities of little boys and girls makes my job so much more enjoyable and fun! 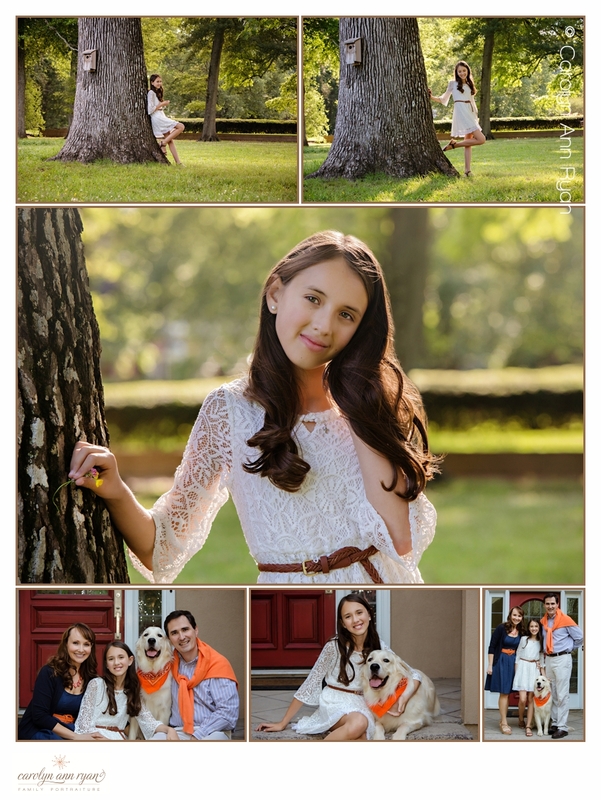 Each year, PPA Charities organizes Family Portrait Month in support of Operation Smile. During the months of September and October, a portion of all of my session fees were donated to this charitable event to help at least one child obtain a new smile with the help of Operation Smile’s amazing doctors. 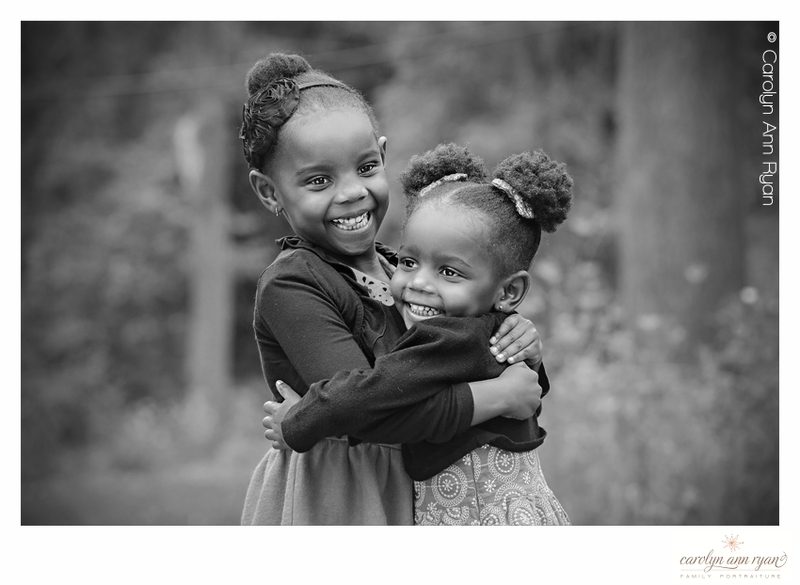 Over the last six years, Carolyn Ann Ryan Photography has helped at least six children obtain new smiles, and I am so proud that we can continue to help and support these organizations and children thanks to my clients. 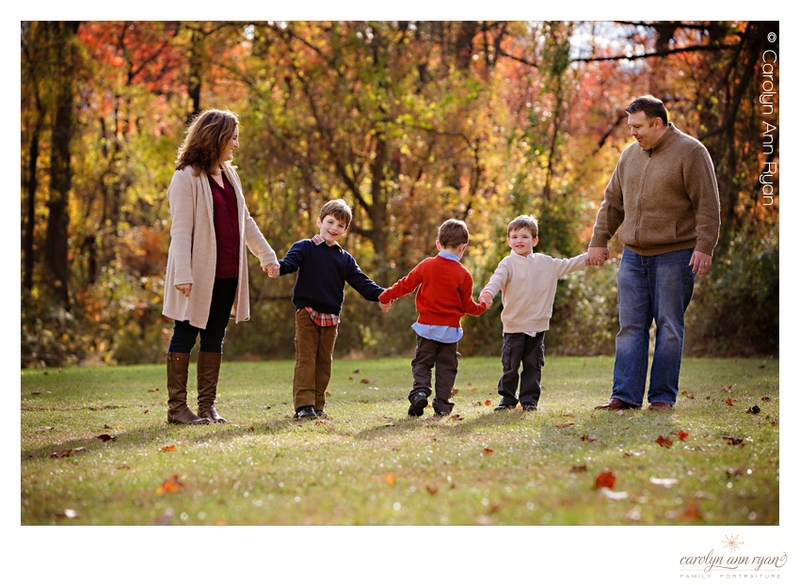 This family is one of the many families I had the opportunity to photograph during this past Fall season, and I just loved everything about the session. The fall foliage was absolutely perfect in the middle of November, and the temperatures were amazing! When the sun shines, so do my clients and so do I! The sparkling yellow leaves look like gold that day. 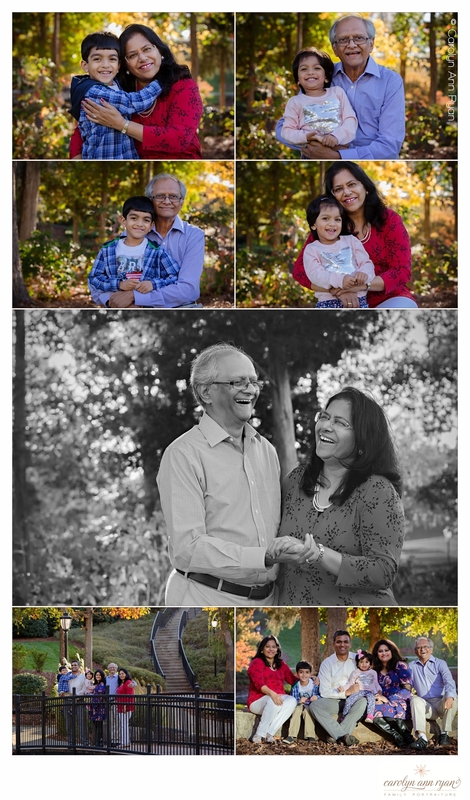 For this session, I love that the grandparents were able to join us for the session, and we were able to capture special photographs with each of them and the grandchildren along with the entire family together, which makes them a perfect highlight for Family Portrait Month. 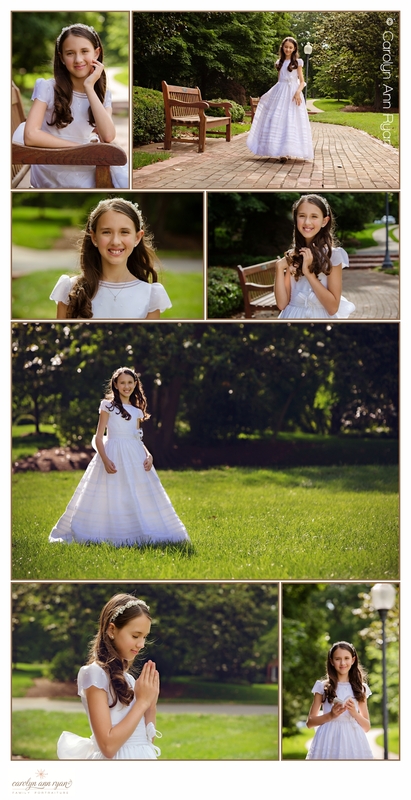 Every once in a while, you find a location that feels like a secret garden that enables you to create enchanting family portraits, and we found one right here in South Charlotte. I just adore this first photograph with the old tree and bird house on the side, and adds to the feeling that this family is just alone in a special place having a beautiful and heartwarming chat with their little girl. The sunlight sparkles through the trees behind, illuminating their story. 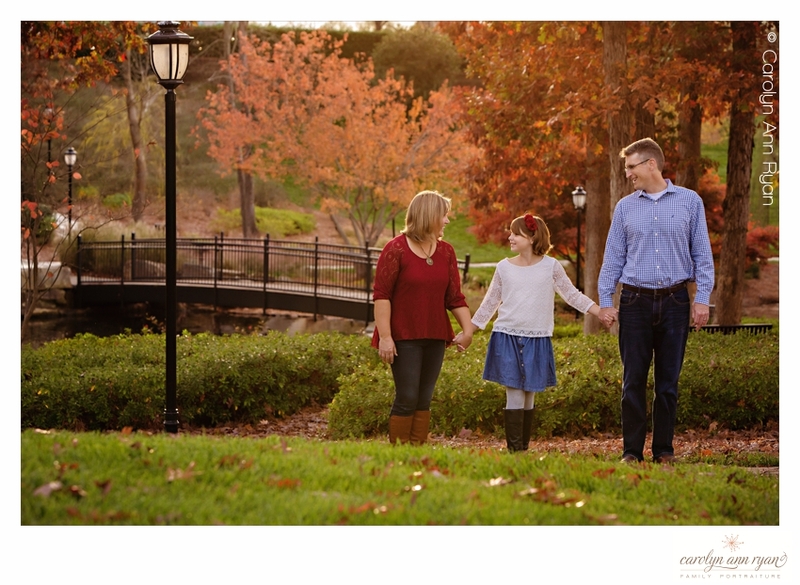 And just a few feet away we found a brick path with a beautiful bench and grassy field to create a perfect setting for their daughter’s family portraits. She truly looked like a princess strolling through the enchanted garden. 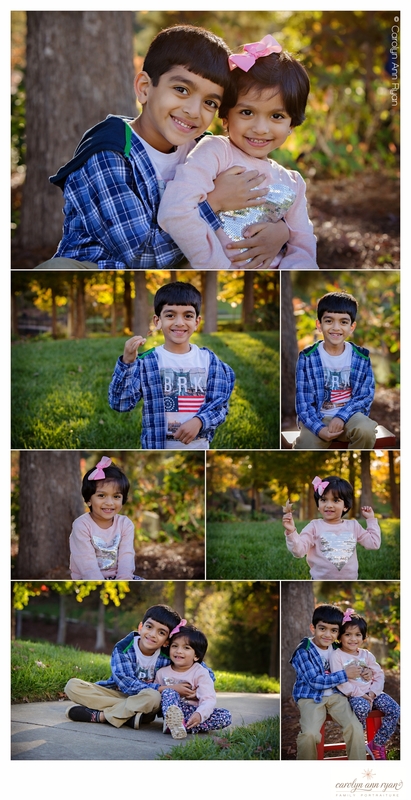 South Charlotte Family Photographer | Voted Best Photographer by South Charlotte Weekly Readers! 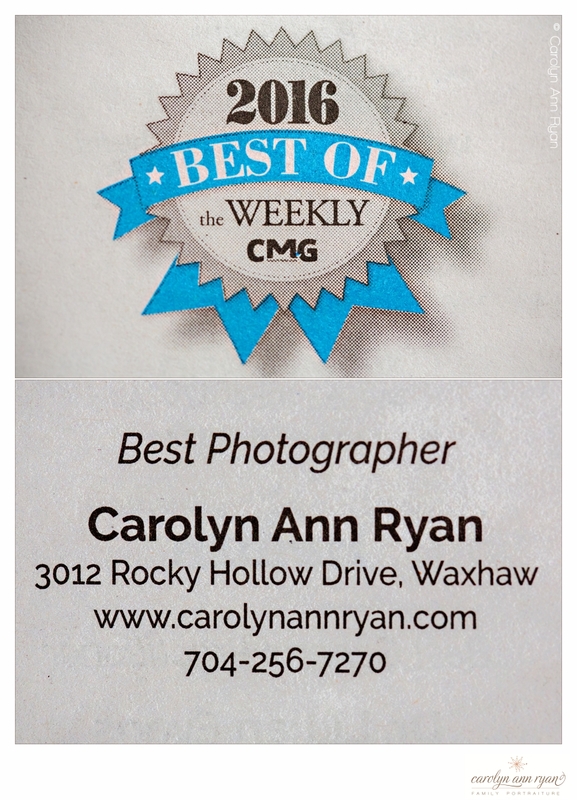 Voted Best Photographer by South Charlotte Weekly Readers! This afternoon, I met my husband for lunch at Einstein Bagels in Ballantyne. We placed our order and proceeded to find seats. Jim mentioned that he was going to grab a copy of The South Charlotte Weekly for us to read. On the cover of the newspaper I saw that this issue contained the announcement of the Best of The South Charlotte Weekly Awards for 2016. I sighed to myself, and immediately flipped to the Professional Services section to see which photographer was voted Best Photographer. And suddenly there it was – my name was right there in the middle of the page: Best Photographer – Carolyn Ann Ryan. I squealed and showed my husband, and I was so thrilled he was there to share that moment with me! Next, I glanced below my name to see my daughter and son’s Irish Dance school, Rince Na h’Eireann School of Irish Dance, had been voted Best Dance School! It was a double win! On the drive home, I couldn’t help my excitement. We have only been in the Charlotte area for one year since our relocation form New Jersey. Not only was it difficult to leave our family and friends behind, but it was equally difficult to walk away from the business I spent six years building in New Jersey. I had to relocate my business over 630 miles and I did not have any contacts, friendships or relationships in my new area. While my skill level and business knowledge haven’t changed, I am essentially starting this business all over again. And yes, there are days where I wonder if I can really do it. Do I have really have what it takes to build this business twice? But then there are days like today where my clients, friends and family remind me how much I love what I do for a living, and I really can’t imagine doing anything else. Thanks so much to everyone that took a couple of minutes of their time to vote for me! I can’t thank you enough for your votes to help me earn this honor! I am so very grateful, and I look forward to working with more families in the South Charlotte area this year and for many years to come! Still looking for a few amazing gift ideas for Mother’s Day? 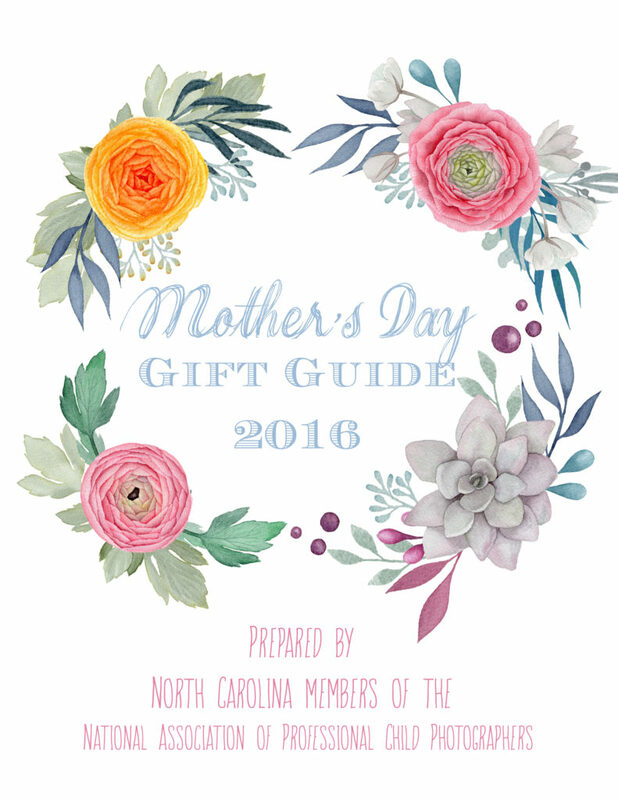 I am so excited to share this Mother’s Day Gift Guide that we prepared with the help of fellow North Carolina members of The National Association of Professional Child Photographers. We teamed together this year to bring you a handful of suggestions from our favorite stores, and we also featured our favorite gift idea inside. You’ll have to visit page 7 to read all about it! This guide was prepared with the assistance of Jeannie DeSena from Words & Pictures by Jeannie DeSena, Jody Dixon from Jody G Photography, Sara Brennan from White Box Photo, and Erika Rigger from Erika Rigger Photography, and I can’t thank them enough for their contributions. I hope you enjoy and if you use any of the ideas within this document, please let us know in the comments! 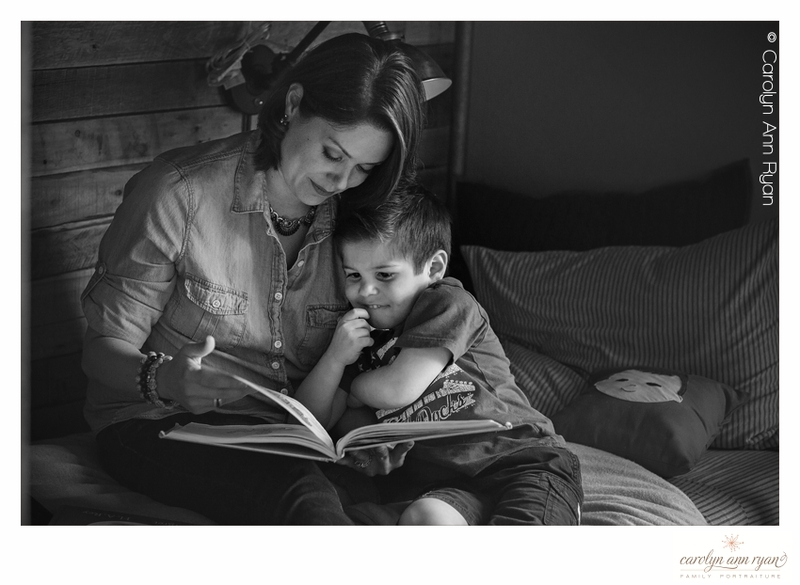 Today is National Tell-A-Story Day and I thought this photograph of a Mom and her little man sharing a story was the perfect image to share today. Isn’t amazing what happens when we open a book to read to our children? All Mom had to do was open this book to read to her son, and this sweet moment just happened. I love how he just cuddled into her arms ready to read with his Momma. It’s the simple, classic moments in life that are filled with memories. They bring us back to childhood and to our favorite places. Being a mom now, I love reading time with my kids and this photograph speaks to my heart as I remember all those nights with my own little munchkins snuggled into my arms and lap ready to read a good story together.